I realize it isn't Tuesday, and that means it isn't Tools of the Trade day, but earlier this week was my wedding anniversary. 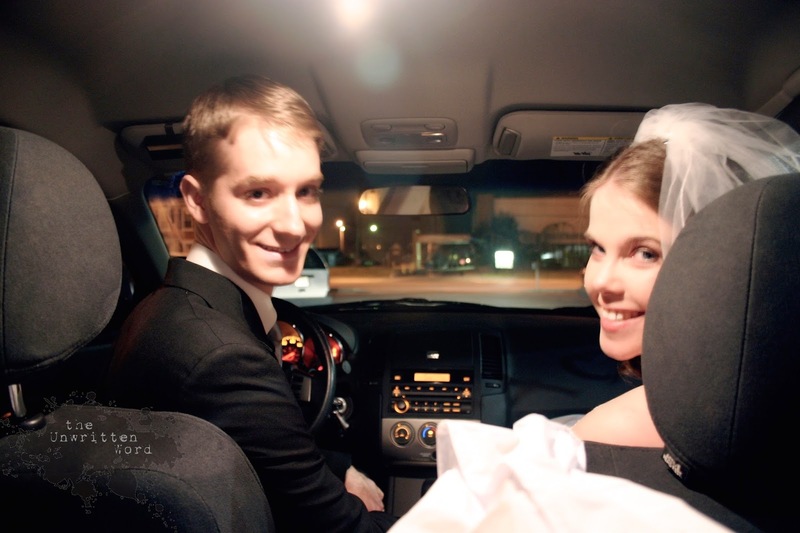 Rather than write a long, languid post about how much Husband has meant to me over our last eight years together, I will spare you the mush (and there WOULD be mush). 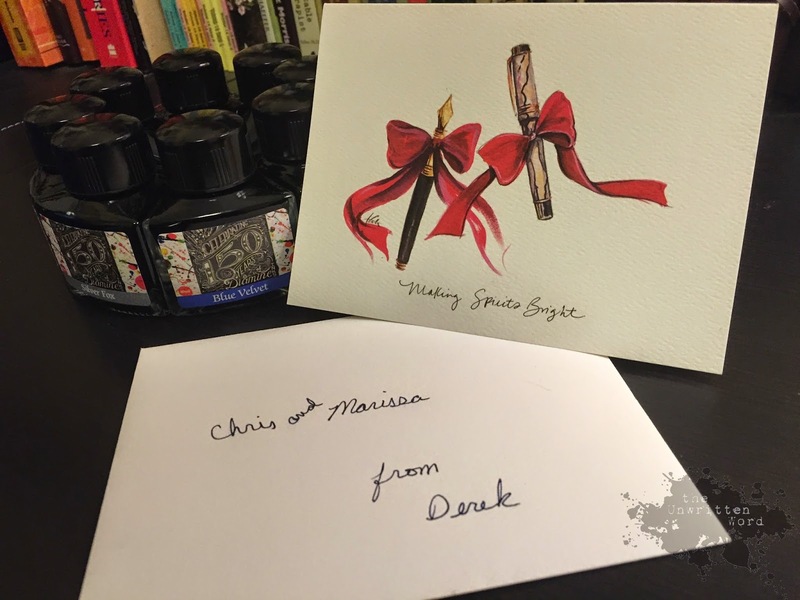 Instead, I will take this opportunity to get the Tools of the Trade part of the blog back in gear in honor of another anniversary: Diamine's 150th Anniversary Ink Set. Husband and I received this lovely ink set as a gift from our friend Derek courtesy of Vanness Pens in Little Rock, AR. Not only did it come to us blazing fast, it also came with a lovely card--a vintage Parker card I am sure would not have been included had the gift been ordered from those sweethearts at Amazon.com, but I digress. 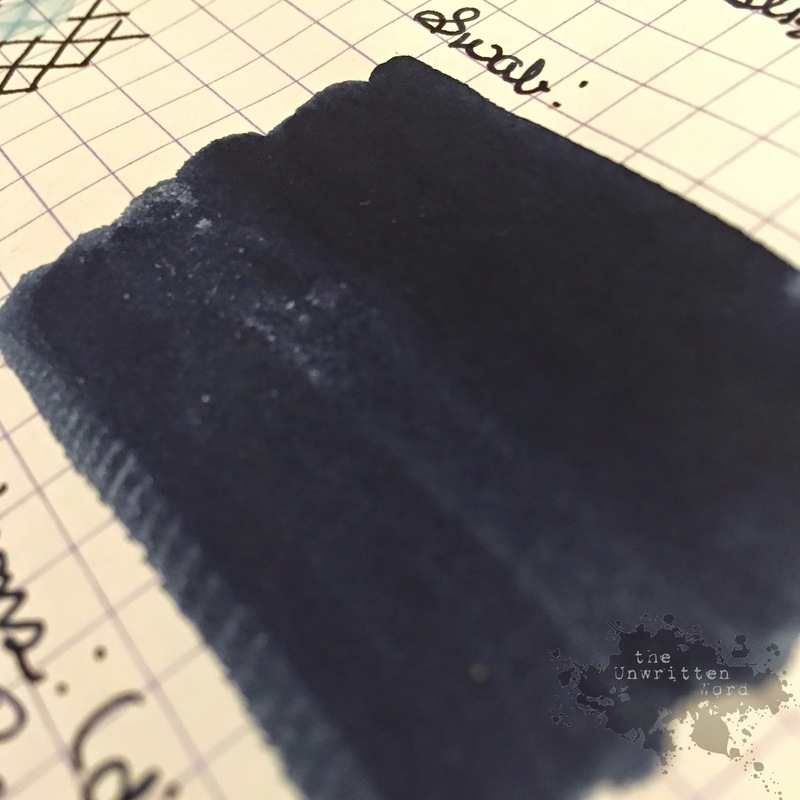 There are eight exclusive inks in the set, though Diamine states they are not limited editions and will be available separately ongoing. This is good news for me because I have no doubt I will be using up some of these colors post haste. 2014 has been a rough year for me, and I have a lot of writing to catch up on in 2015. 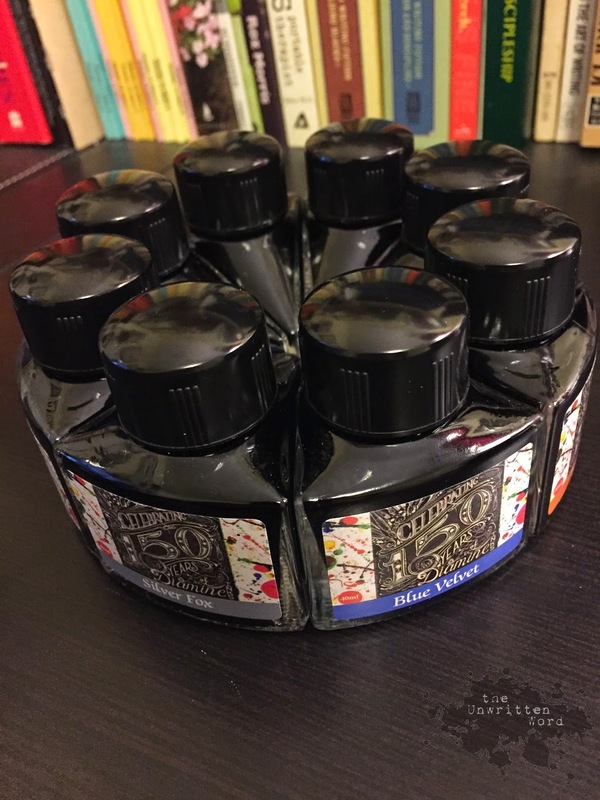 Each ink bottles comes in a unique 40mL wedge-shaped bottle that fits together with its brethren to form a circle, or an ink-pie/cake/insert round dessert. They're definitely pretty enough for display in any inkophile's study, and Derek suggested we get a lazy Susan so we can spin-the-ink-wheel whenever we need to choose a color. 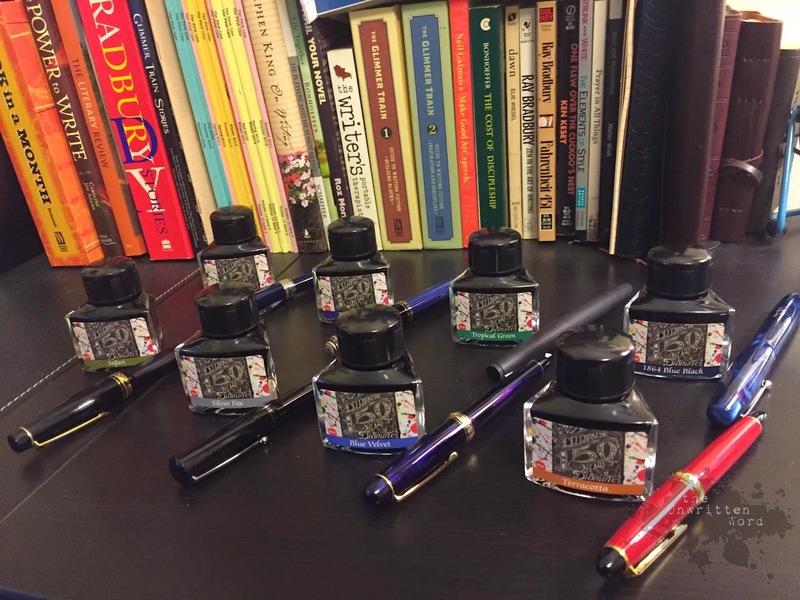 I'll be posting individual reviews in the near future, but here are color swabs of the eight exclusive 150th Anniversary edition inks. 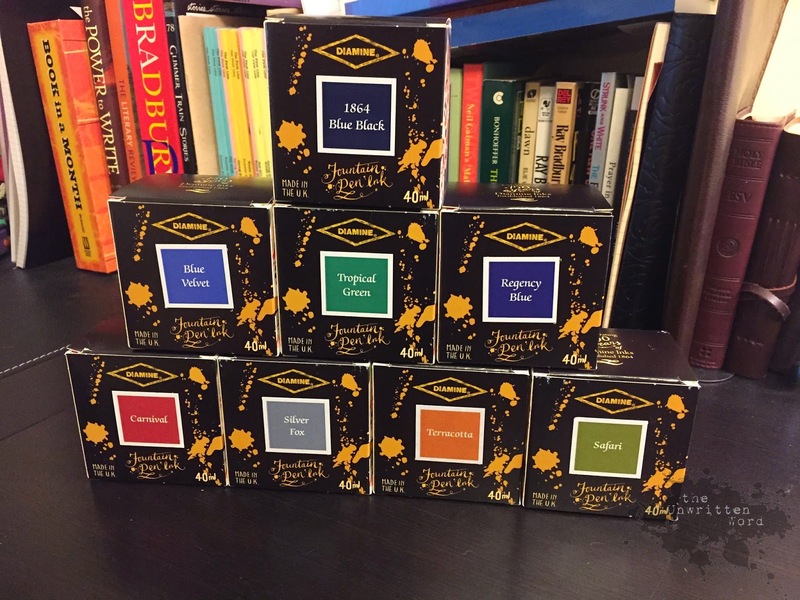 I enjoy reviewing new inks about as much as I enjoy early Christmas presents, so be sure to check back as I post in-depth reviews of each of these colors. If you just can't wait to see the review of your favorite, go ahead and take the plunge. 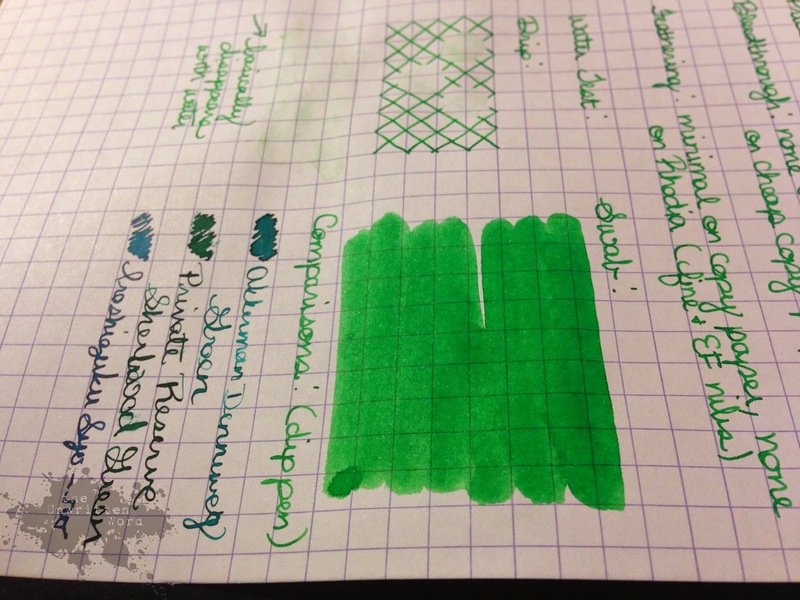 Overall, these inks do Diamine proud. They're vibrant, well-behaved, and packaged attractively. Until then, I think I'll go work up some of that mushy stuff I was talking about and spread it to Husband. He's my favorite, and I hope he never, ever doubts it. I love you, Bella bear. Always. 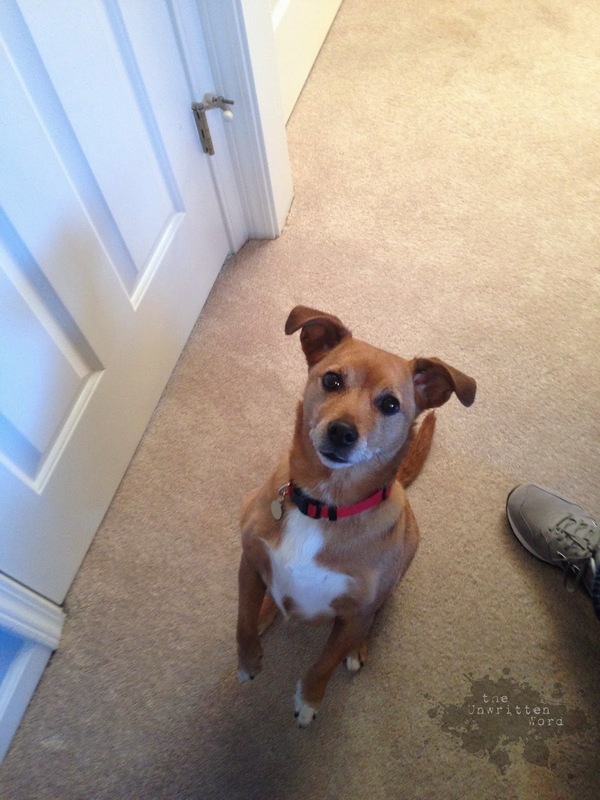 My sweet Bella died yesterday. I would say my heart is broken, but I don't think it is. You see, when your heart is just a few notches softer than average, it doesn't cleanly break in two. This spring and I have a lot in common. 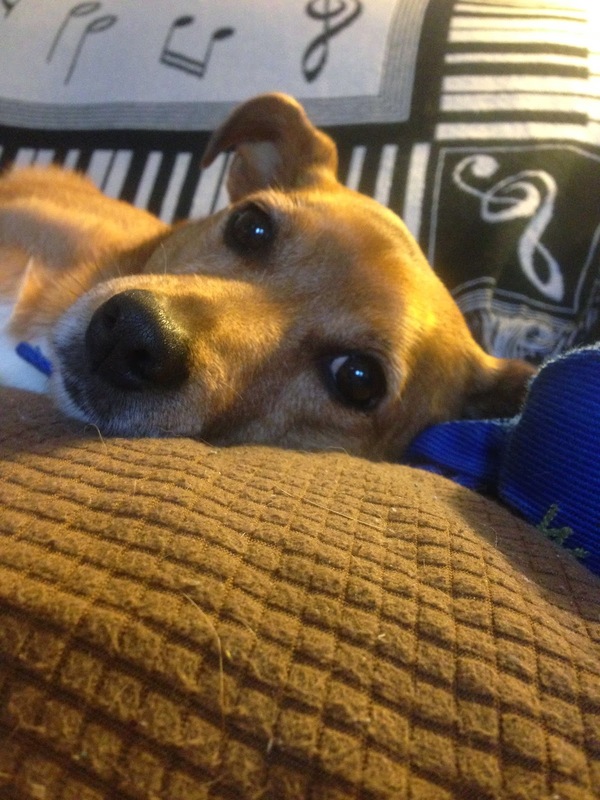 It is a hardworking little fellow, coiled tight and ready to bear the weight of whatever comes pressing on it. Then, if all goes well, it will bounce right back to where it started and wait until it is needed again. I like to think I share some of these attributes, and that somewhere along the line someone will remark that, like the spring, I am at least somewhat useful in my simplicity. 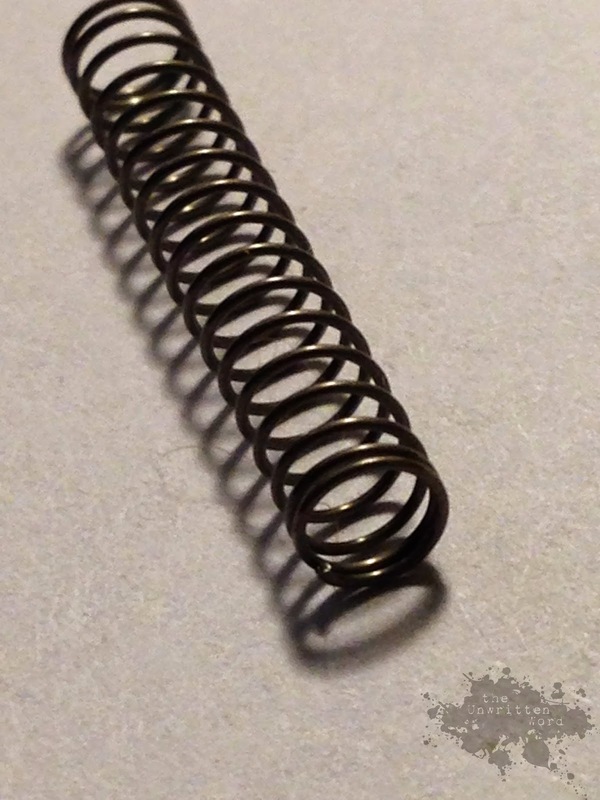 Since I am a person and not actually a spring, I should be able to uncoil myself at the end of a long day to relax with a beverage and go about whatever unproductive activities non-spring people feel like doing of an evening. I am not doing this right. I am not doing this at all. 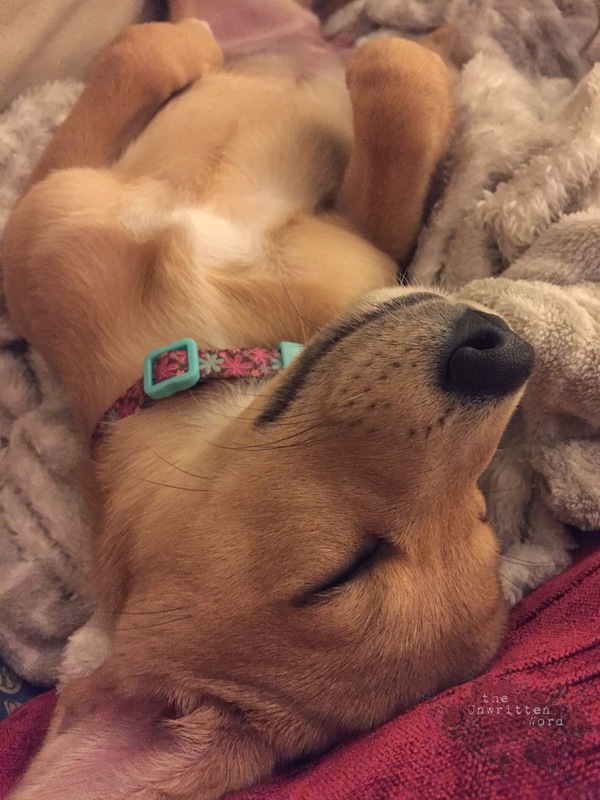 I am failing at not being a tight-coiled little spring, and all my bends are weary. I write this tonight not to whine, not to philosophize, or even much to inspire except to say that I am trying to uncoil myself and be a person, one who remembers she likes to write, who can pay attention for a whole movie, and who would cut off circulation in her whole body rather than disturb a sleeping cat. I miss these things about myself, and if you're like me, you probably know what I mean. Here is the inspiration part: the only element necessary to change is the desire to do so. Even stupid springs know that. As I mentioned yesterday, if you see me out in person, odds are you will find a notebook somewhere on me. I have them coming out of my ears (not literally, though a pair of earring notebooks would be interesting...), and I use them often. I keep them with me so I won't miss out on those important droplets of information that rain down so unpredictably. Sometimes it is a quote, sometimes an image, sometimes an idea. They're all things I want to keep, and I just don't trust my spongy gray-matter enough to hold onto it for me by itself. These notebooks are not quite journals, though they are certainly personal. They are my commonplace books. Yes. They're all full. All. Commonplace books have a long history, dating back to the 15th century Italy when they were known as "zibaldone", or "hodgepodge books." 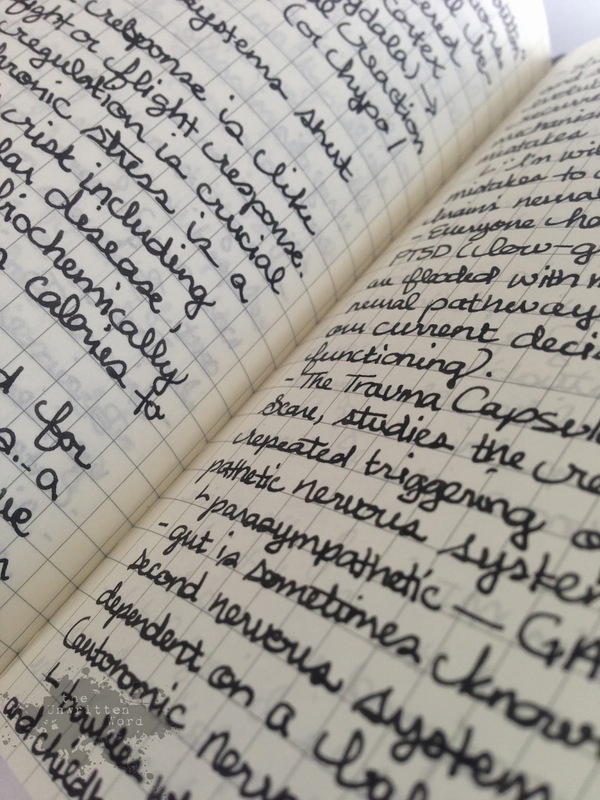 That's a good way of describing them--a commonplace book can hold a little bit of everything, and each is unique to its owner. Many great minds have used them to store their thoughts and information, including John Locke, Mark Twain, Henry David Thoreau, and Ralph Waldo Emerson. For what it's worth, commonplace books also factored into the A Series of Unfortunate Events series by Lemony Snicket, and that deserves as much distinction as anything. Allow me to outline my incredibly complicated commonplace book indexing system. Every page of my commonplace book gets the topic of that page on the upper corner, and the right page (only, unless it is a top bound spiral notebook) gets a page number. When the book is full, and I do mean every-single-line full, I go back and fill out an index card with the labels and contents. I tape it to the back cover of the book, and then I grab up the next one to start all over again. My commonplace book is a comfort. I know I always have a safe place to scribble down a thought or an image so I can save it for later when I'm going to "really" write. If I'm away from home and inspiration calls, I can do a little novel drafting and the index keeps me from losing the pages in the mix. These books also hold my idea stockpile. If I can't find something to write about, I can flip through them and find all kinds of inspiration. When I do find one of those rare free moments to write something down or read something back, I feel more intensely myself than any other time throughout my day. That's a pretty big gift for a tiny little pad of paper. It might be a notebook to you, but it is more than a place to scribble a grocery list. My commonplace book is like a beating heart tucked into my purse or pocket, and I am better off for having it there. Thank you to the lovely Ellen Morris Prewitt for tagging me at Creative Synthesis to share a slice of my writing life. Ellen is an incredible asset to the writing community in Memphis and at large. She is an award-winning story writer, novelist, and (near and dear to my heart) she facilitates a weekly writing group for people with a personal experience of homelessness. More than that, she is kind with her heart, generous with her time, and so very, very good with her words. You don't have to take my word for it: read her post Spinning Plates, or The Writing Life for a picture of how she makes it all happen. While you're at it, head over to Cain't Do Nothing With Love to listen to her collection of award-winning short stories. You will want to thank me later, but instead, donate to one of the worthy charities she has paired with each of her stories. The one on the left has a story to tell. I know it. 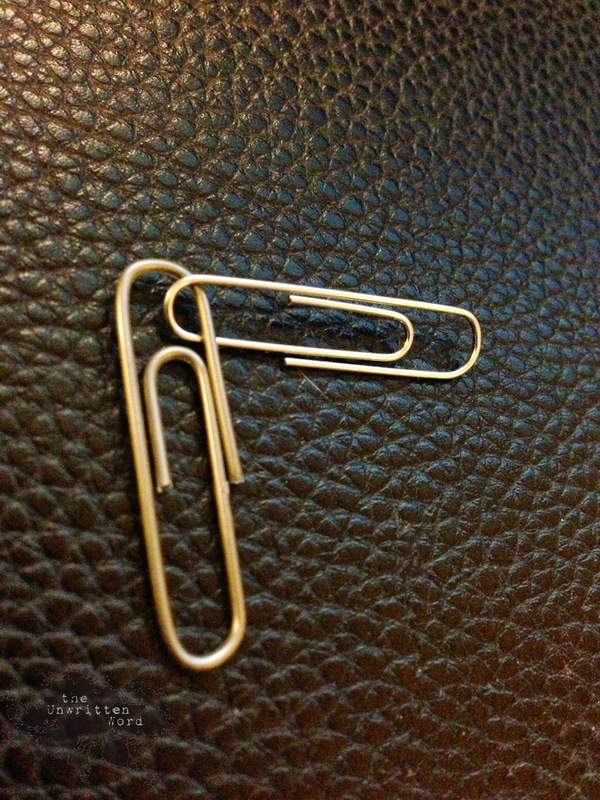 A friend once told me, "You could find significance in a paperclip." She was kidding me about my habit of philosophizing everything, but she had a point. Well, maybe not a paperclip exactly, but binders, peanut butter, and trips to the post office are fair game. The point is, I'm a thinky-type person, and it doesn't take much for me to get an idea. Having the time and energy to use them is another matter. As Neil Gaiman once said, "You get ideas from daydreaming. You get ideas from being bored. You get ideas all the time. The only difference between writers and other people is we notice when we're doing it." It is so true, and that is why I can never be caught without a notebook somewhere on my person. I never know when a provocative paperclip might cross my path, and I sure wouldn't want to miss it. 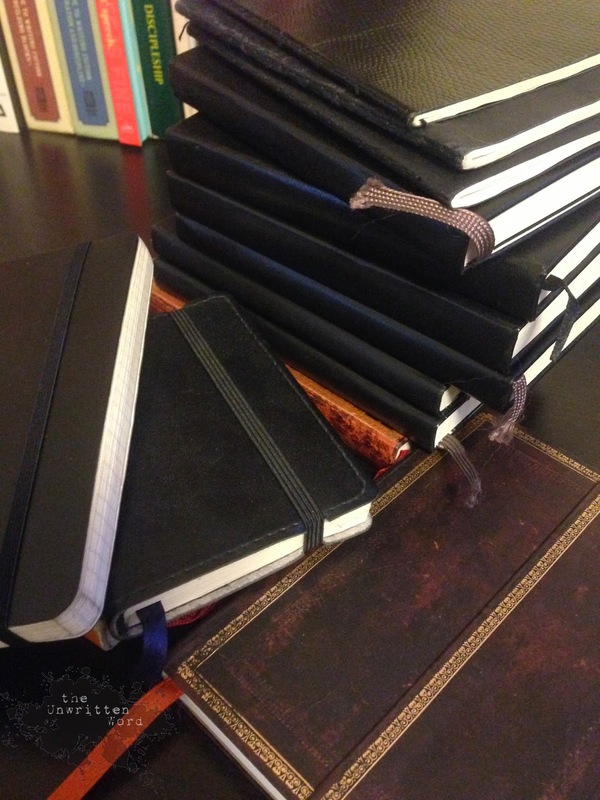 Those notebooks are a crucial part of the process in all my work. I've got more novels in progress than I can count on both hands (even with the help of a few toes), and every single one of them started with some tiny little germ of an idea that I chased around long enough to grow it into something worth reading. This is usually accomplished through a combination of guided daydreaming, good music, and miles of unusable meta-writing. 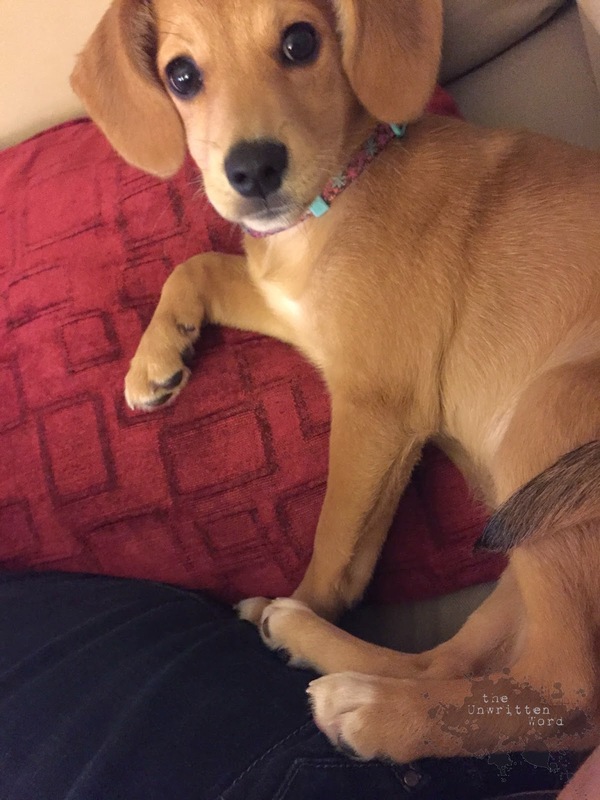 I write in the notebook until I feel that I'm chasing my tail, and then I pull out the computer, fire up Scrivener, and start typing things in a more final form. My notebook is my palette for mixing colors and sketching, my computer is my canvas where it all comes together and starts to feel real. It is also worth noting my ongoing participation in National Novel Writing Month, or NaNoWriMo. This involves writing 50,000 words of an original novel in 30 days. I have participated and completed the challenge every November since 2007. I have done the challenge a couple of extra times as well, once with a friend in a random August, and I also took the challenge in the very first Camp NaNoWriMo. I'm not gonna lie, a lot of the stuff I have cranked out under that kind of pressure has been pretty crappy, but on the other hand, those challenges left me with some sizable lumps of clay with which to work. It's good for my discipline, but I'm starting to think I need a challenge to work on my discipline for finishing work rather than starting it. Currently, I have a few irons in the fire. Because of my habit of writing half a novel and then moving on to the next shiny-object idea, I always have plenty I could work on, either drafting, revising, rewriting, or submitting. Right this minute, I'm working on my nine-thousandth rewrite/revision of one literary fiction novel, my first major revision on a YA novel, submitting one short story for publication, and completing two other short stories I've had outlined forever, but haven't finished. It sounds like a lot when it's out there like that, but I tend to work on things in spurts depending on what I'm feeling at the time. The lit fic novel is my "kitchen sink" novel. I am working on turning it into a workable piece from a lot of fractured rewrites. There's not much to say about it at this point because it's still growing itself a backbone and is nowhere near taking its first steps. The YA novel is called In My Place, and involves teenage boy who is killed in an accident and finds himself a ghost wandering around his old life. He ends up possessing the body of a classmate and must navigate the other boy's life, finding it very different from his own. 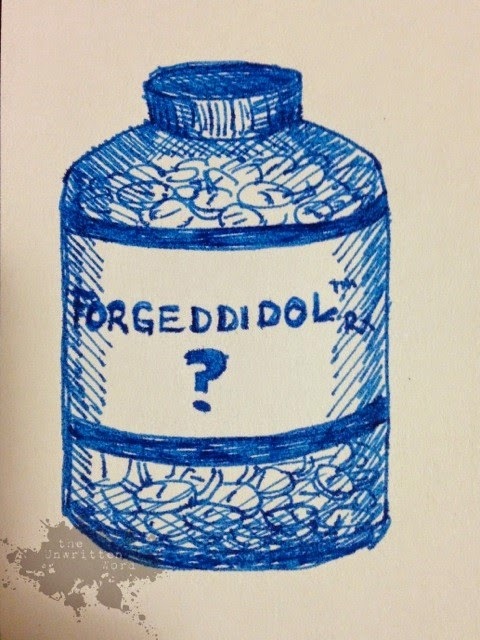 This project began as one of my better NaNoWriMo efforts, but I never got the ending on it. I am tweaking the beginning (of course) so things will fit better with the end I have in mind. It is my goal to have a completed draft of this one before the year is out. I devour stories. Anybody's. I just love them, all shapes, all sizes, all flavors. Whether I'm sitting with you while you share some part of your life with me or I am reading my new book-of-the-month, I am already panning for gold in what you're telling me. Even something as simple as an unusual turn of phrase has a way of wriggling up in my mind and aggravating things. It keeps me thinking, and sometimes, when I'm lucky, it breaks my heart just a little bit. I like things that way. Knowing this as I do, deep down in a place somewhere just to the right of my spleen, I realize that I must write. I want to be understood. I want to aggravate people's minds. I want to break their hearts just a little bit. Next week, please check out the next stop on this blog tour! 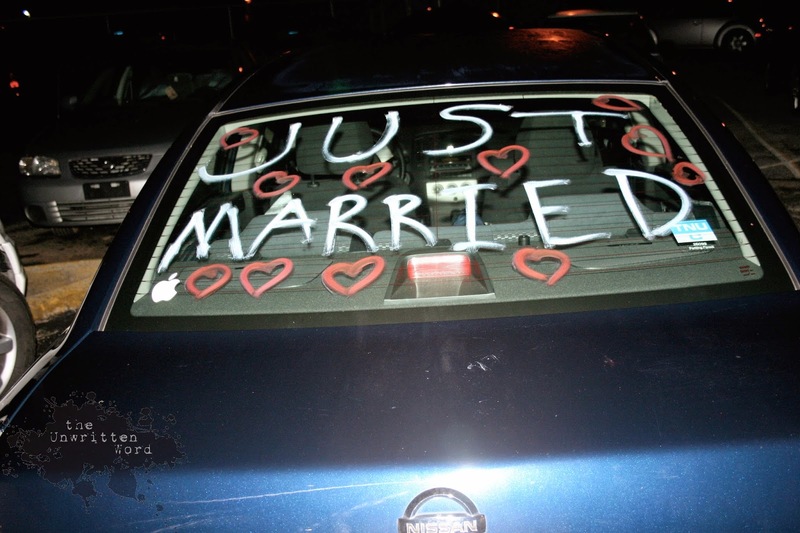 Kim Messer blogs at 40 Year Old Re-Virgin. Kim has vast experience as a professional editor and freelance writer, and she is basically just a wonderful person. Trust me. I wouldn't lie, because then Kim wouldn't like me and I'd be sad. Her blog is a brave one, full of heart and reality. Please spend some time getting to know her there. You will be so glad you did. Jennifer Sudbury. You will never meet another Jennifer Sudbury, and that is just as well because the original is all you need. She is starting a new blog at The Other South and you should be happy about it. Read it, love it, but whatever you do, "don't bless her heart". Stacey Gamble is my long suffering writing buddy and friend-at-large. She is one of the most creative people walking the planet, and you would know that if you had been reading her blog Searching for Wonderland. She splits her creative time across a number of endeavors, and I'm hoping she'll find a few spare minutes to share some thoughts on her writing life. It has been FOREVER since I've posted a Tools of the Trade review, and I have missed them! I love everything about writing, from picking apart pieces of my day in search of nuggets of inspiration and motivation for content and productivity, all the way to poring over the meta-writing experience to examine the act of writing itself, whether it be reviewing inks or obsessively changing the default font on my word processor so it is just right. I so enjoy doing reviews that may help others find more joy in their writing. More joy, more writing, more better. I've been going through a dry spell in my own writing life, not so much because of writer's block, but more because of a severe lack of time and energy. These seasons of life come and go, and what is important is to always keep your goals in mind and to try to carve out little slivers of time for things you enjoy. Sometimes for me, that is as simple as finding an ink to write with that is in a better mood than I am. 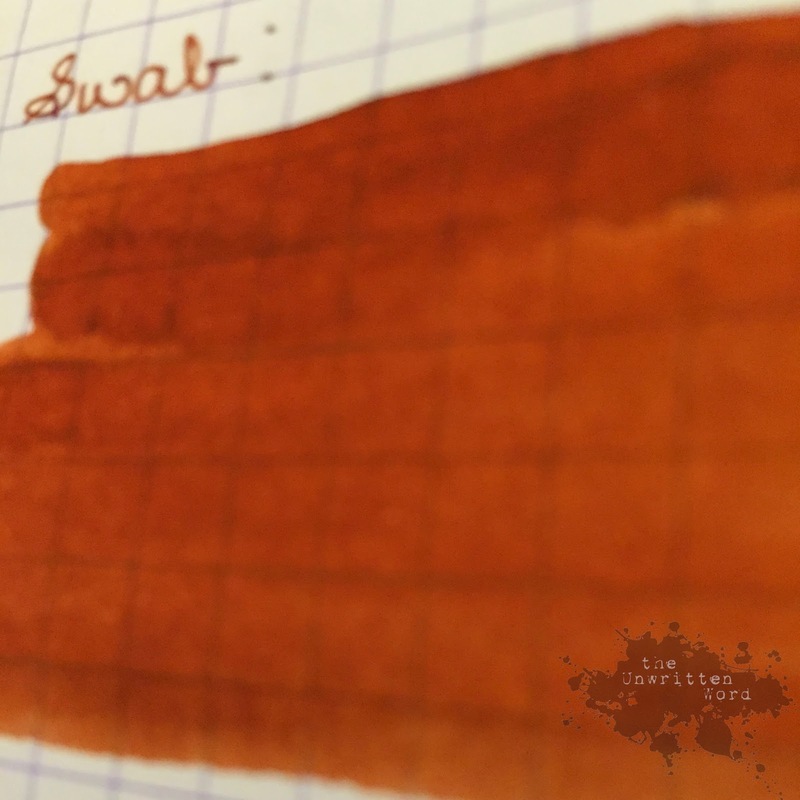 Very often, that ink is Diamine Apple Glory. 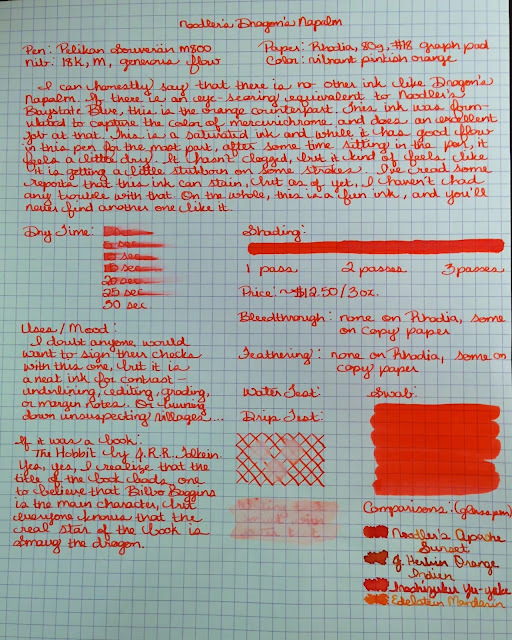 As I mentioned in my Noodler's Firefly review, I collect the Lamy Safari limited edition fountain pens, so every year I get a nice, bright new color of pen and I always go searching out an ink to match. 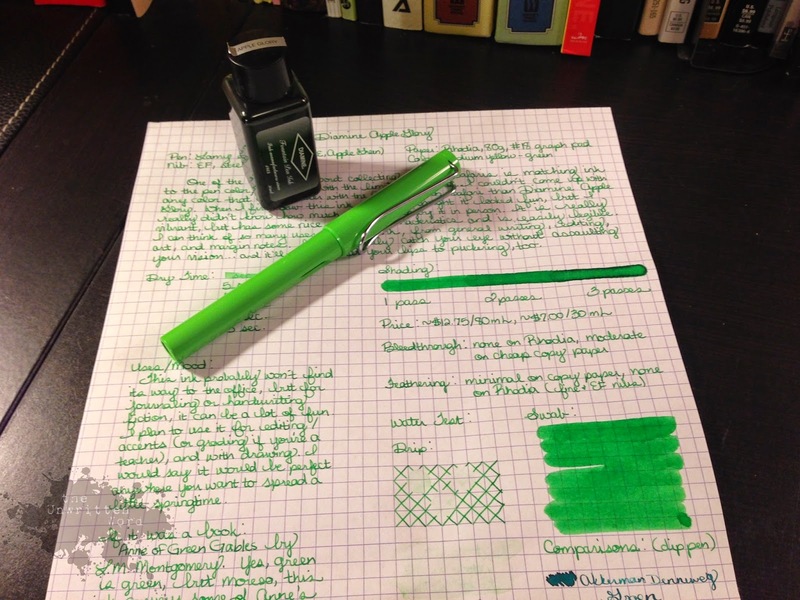 In 2012, it was the Apple Green Safari, which I paired with one of the only green inks I had on hand at the time, Private Reserve Sherwood Green (which is a lovely ink, but no real match for the pen at all). 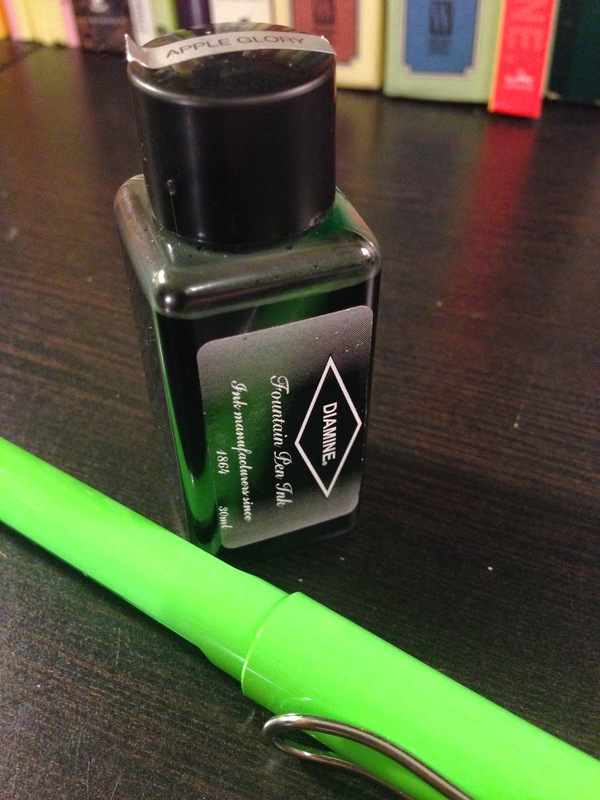 I didn't think much about it again until Vanness Pens ran a discount for the 30ml bottles of Diamine inks at the Arkansas Pen show. 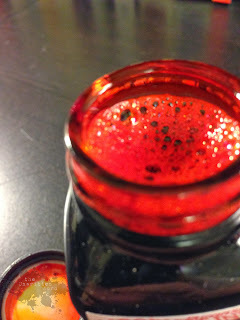 I pawed through their stash and snagged a bottle of Diamine Apple Glory, thinking it would be a good "sometimes ink." 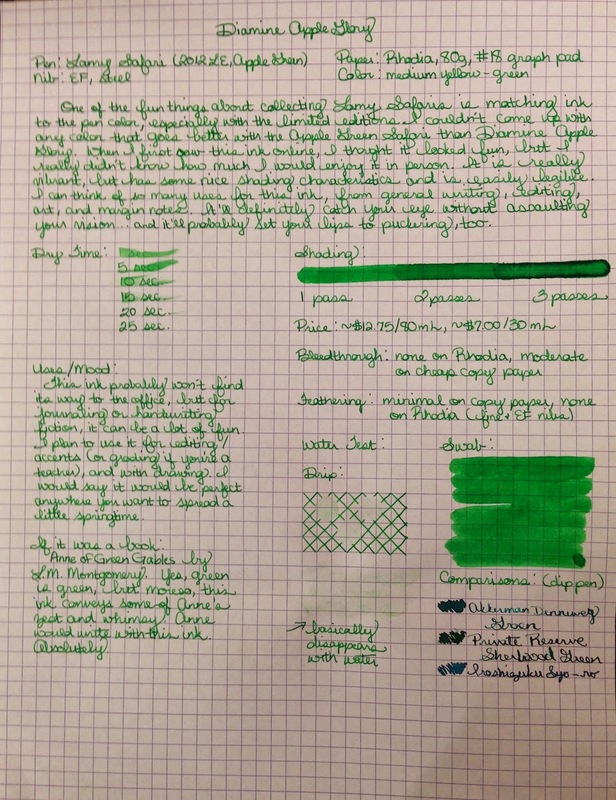 I paired it up with my Apple Green Safari and settled in to write a few lines in an ink I figured would be too bright for everyday use, but might be fun for art or occasional writing. I was wrong. 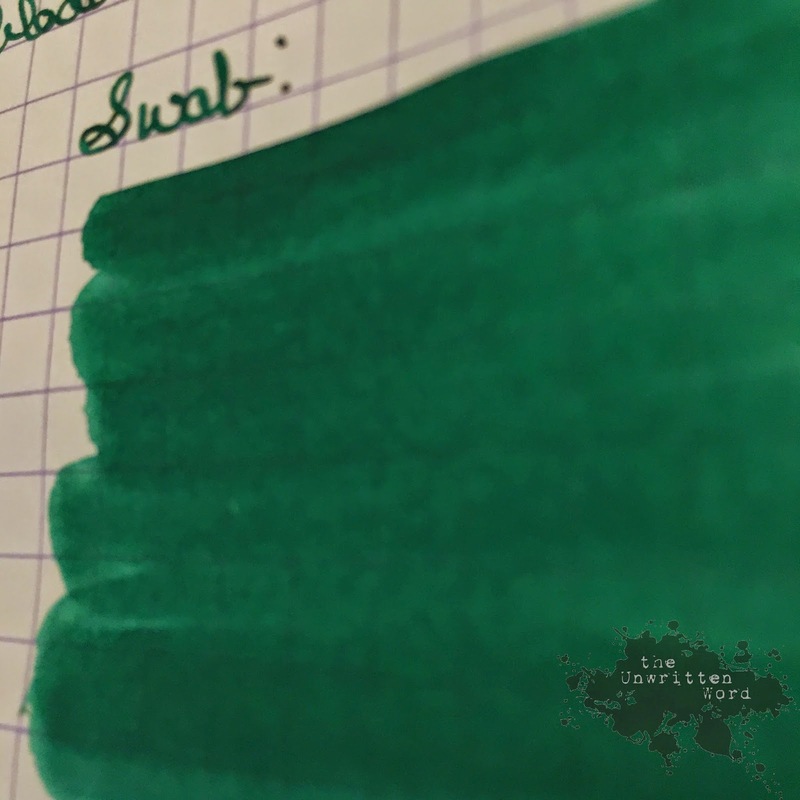 The ink was such a perfect match for the pen, with a subtle hint of blue mixed in with the yellow-green, which gives it a sort of "heft" on the page. It is not only legible, it makes words look as if they're floating above the page itself. Very cool. 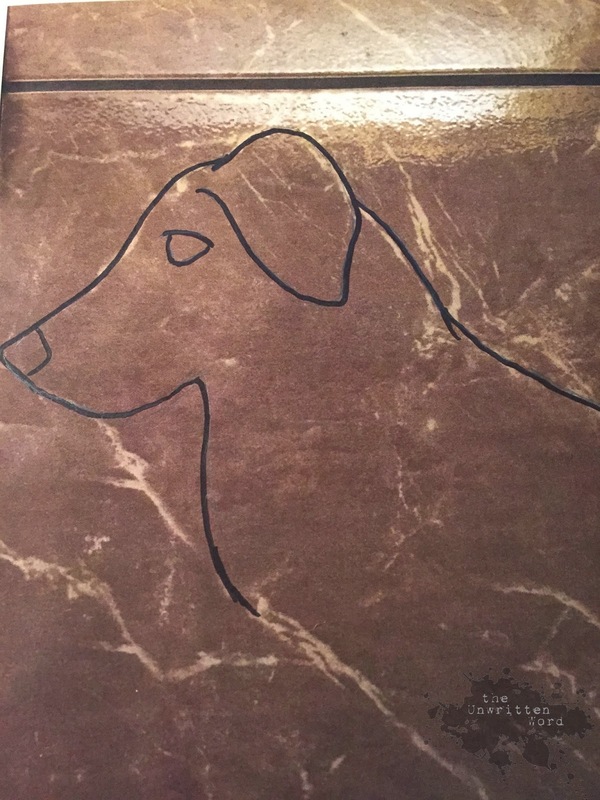 This is a pretty straightforward ink, and I haven't noticed any particular behavioral concerns. 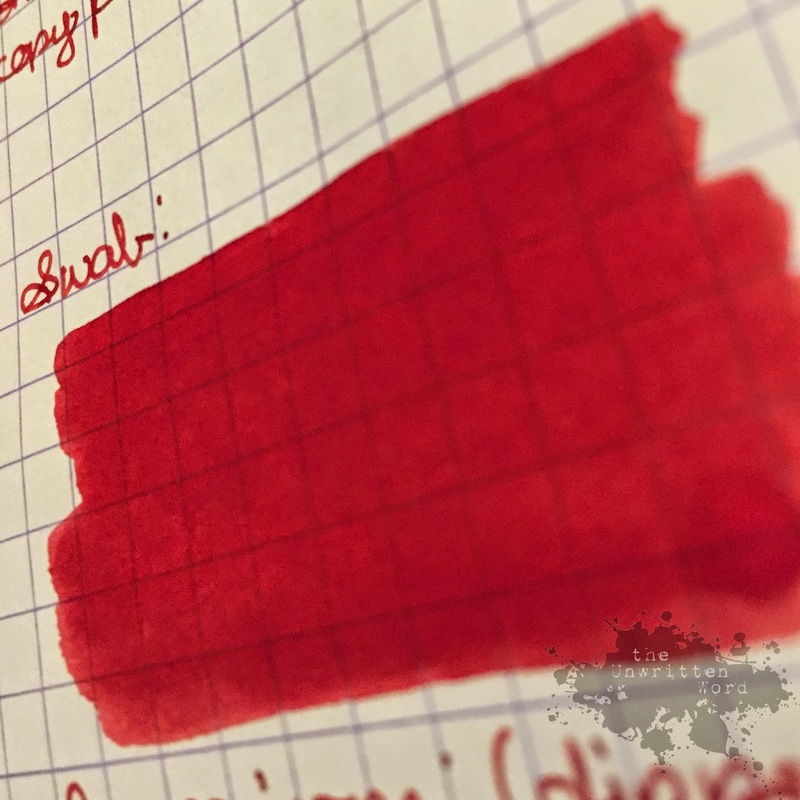 I haven't had any staining, it behaves well on most papers (maybe some slight feathering on cheaper papers, but nothing out of the ordinary), and it flows well. The only real caveat is that it is very susceptible to water, so though it may beckon you to do so, I wouldn't sit and write about the beauty of a gentle summer rain while actually in a gentle summer rain. I'm sorry for the quality of the scan--it's actually a photo because my scanner doesn't handle these light and bright colors too well. Even though the white balance is off (the paper is actually very bright white), the general character of the color is present. Honestly, it is so much nicer in person, you should really just stop reading this review and go get a bottle of this ink. If you're still not convinced, feast your apple-loving eyes on my handwritten review. 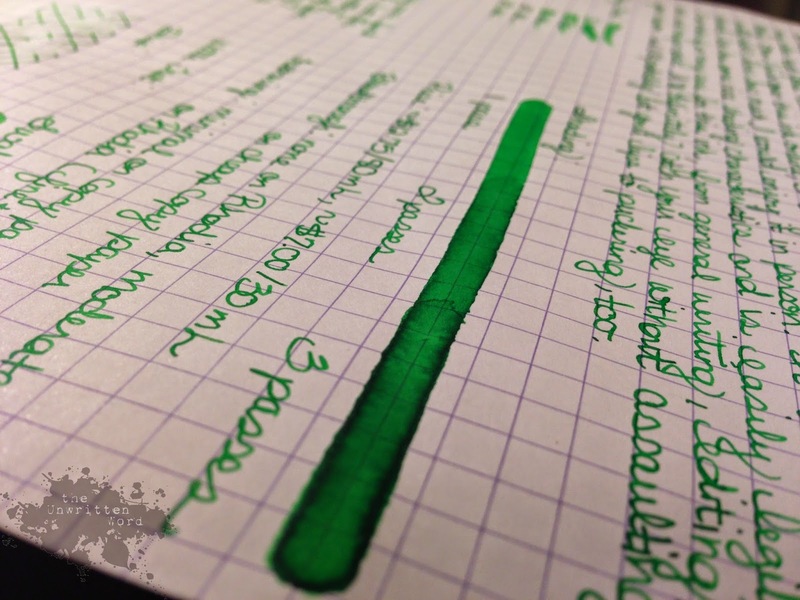 I guarantee this happy green ink is in a better mood than you are. Sometimes, when the problems of the world get a little too large, I go for a drive. 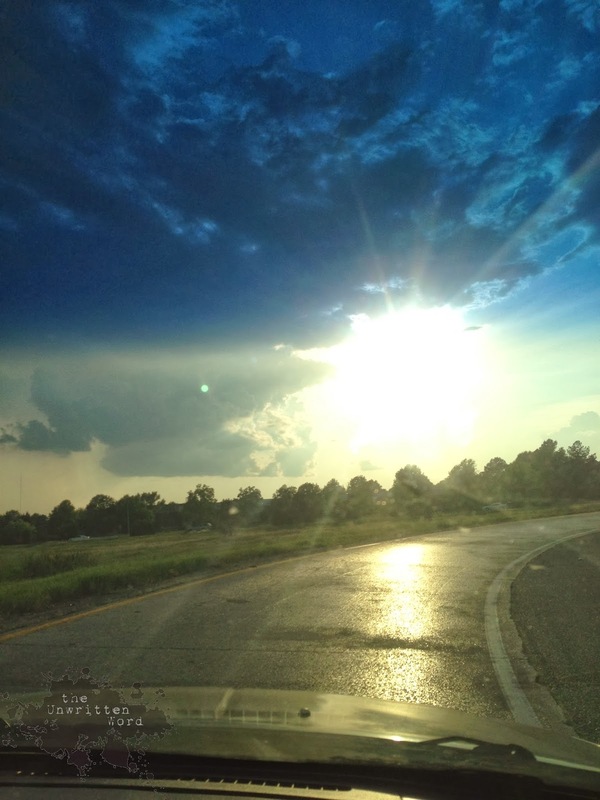 When I am alone in my car, I am in my own little pod and whatever is going on with me and my day is isolated there. 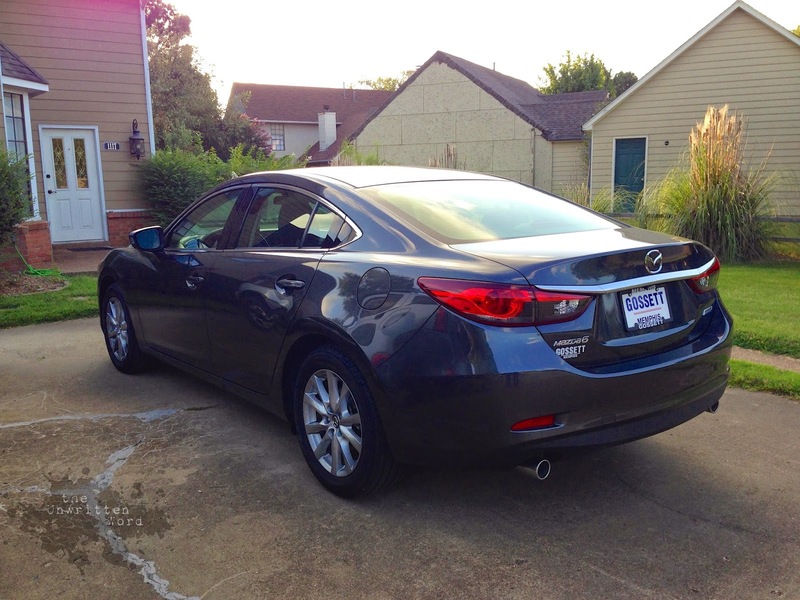 The other motorists on the road need only be concerned with my driving, and my person-hood is my own. For me personally, it is a time for prayer, deliberation, solitude, creativity, and wholeness. Sometimes, when I have a client with whom it is difficult to build a relationship, I find a reason to drive them somewhere. I don't know if it is because of the inherent trust of riding in a car someone else is driving, maybe because my eyes are locked on the road and I'm not looking at them, or maybe just because it feels safe, but I find it tends to get people talking about what's on their mind. I jokingly call it "Dashboard Therapy." You won't find it in any psychology textbook, but it works. 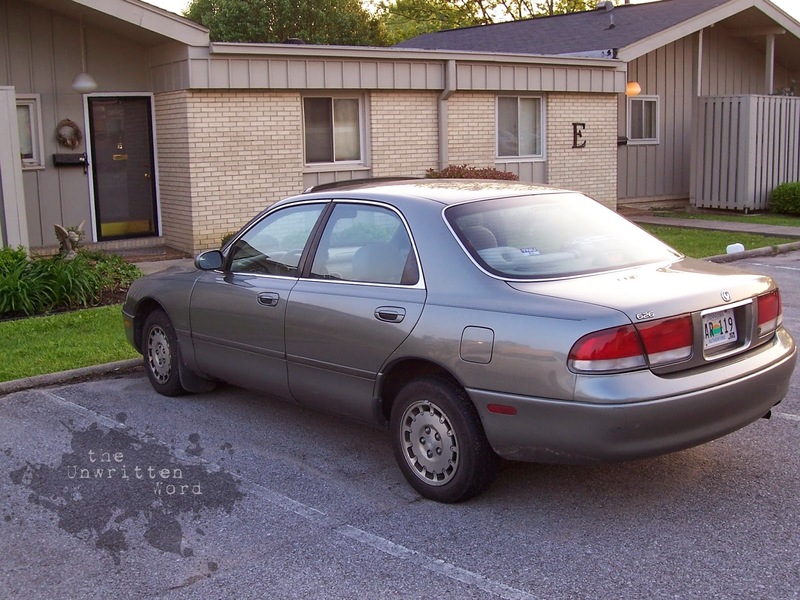 A great deal of the miles on my car have been banked directly into the pages of my manuscripts. When I just can't seem to work out what I'm thinking or feeling about a writing project, I go for a drive. I put on some music that fits the mood, or sometimes I just leave the radio off. I drive around and look at things, trying to see them as a character would. I test out dialogue--there's no better way to do it than saying it out loud, (and no more embarrassing way either)--and search for unbidden inspiration. My dashboard has absorbed so many of my prayers, thoughts, and confessions, it must be a holy relic by now. Who cares that it has cracked in the sun and needs a good wipe down. It has become an integral part of my creative life and of my desperate need for solitude. It may not be exactly poetic, but there's something to it. Take a ride today. Whatever it is you're working on, whether it be part of your creative life or just hurdles you're jumping in the real world, and dump them in the passenger seat. Talk it out, sing it out, pray it out, whatever it is you need to do, but speak it out loud and saturate your vehicle in the fullness of your mind and heart. If you've got a character you just can't wrap your head around, picture him or her doing this exact exercise--what is it they think about when they're driving a lonely highway with no one to judge them and only the dashboard to listen? There's no rule that says the same person who enters any room must be the same person when he or she leaves it. 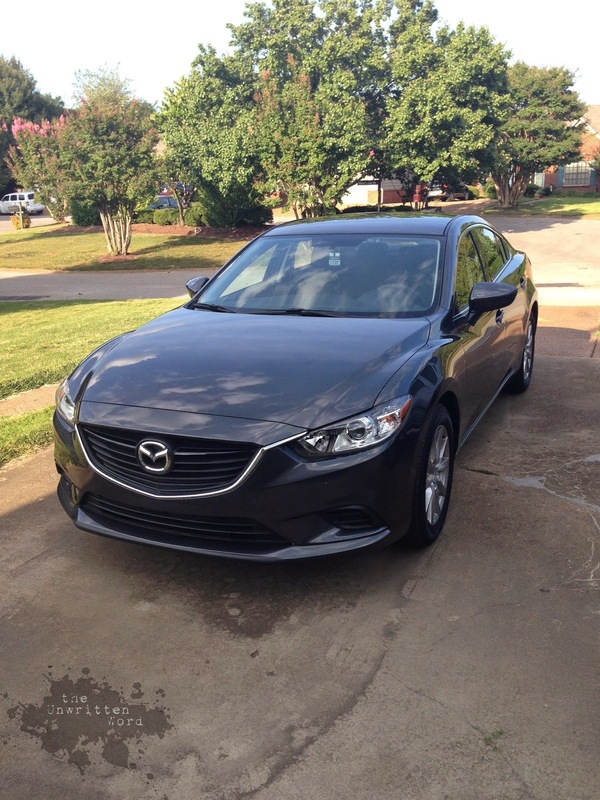 I figure the same must go for cars (and probably even trucks. Probably). It feels like a month has passed since Monday. Month and a half, tops. Lately I've been wearing an extra hat (or five) at work, and I think it's catching up with me. At least, it is catching up with my back, and where my back goes, unfortunately the rest of me must follow. It has gotten to the point that the last two days my dinner has consisted of Doritos and ibuprofen--and I didn't even mind. My to-do list is piling up like a sky-high stack of dishes in a restaurant sink. Every one I wash is quickly replaced by another, even grosser dish. Yesterday, I found myself between "dishes" and I decided to finish up a simple, piddling task I had been putting off. All I had to do was thread a label into the plastic spine of a binder. Easy, no? If I had to guess, I would say this binder was forged by the fires of Mt. Doom and protected by an unbreakable curse that could have netted the world an extra Harry Potter book. The first label I printed only made it about an inch into the plastic before it tore. I printed another one and tried as hard as I could to cram it in there until it was all mangled up like a used tissue. I tried folding it to make it stronger, but then it was too thick. Unfolded, it stood no chance. What should have taken seconds was racking up minutes, and I didn't have any minutes to give to such a small thing. There were too many big things looming over me, waggling their fingers and taking swats at my tender conscience. Since every other attempt at force hadn't worked, I did the only thing left: I slowed down. I thought small. I moved it in such tiny increments I could barely make out my own progress until I saw that the crumples and tears from my previous attempts were sliding slowly under the plastic. "This is ridiculous," I said to myself and chewed on my molars. It was working, but not nearly fast enough to suit me. The progress was just too small for the time I had allotted for the task. "This wouldn't be fast enough to suit an ant," I grumbled. But it would have been. The more I thought about it, I realized I was looking at things all wrong. I was looming over the project like a time-crunched grizzly bear, when I should have been looking up at it like a persistent ant. If I was as small as an ant and I saw the progress I was making, suddenly it wouldn't seem like such a tiny amount. I would look at the ground I had gained in those too-fast seconds, and I would be proud. I would see those inches, and they would become miles. After that crossed my mind, I realized how silly I was being, getting frustrated over a task I hadn't even dignified as a legitimate undertaking. I had wasted more energy being frustrated than I had time in slowing down. This should not have been any new epiphany to me. I have been working for years with a population of people whose small victories I celebrate as often as I can. I never waste an opportunity to tell a person when I see good in them, or when I am proud for them, and that includes when one particular client remembers to use a napkin to clean a spill, or when someone says "no" when every fiber of his being tells him to say "yes," and he hands me the $20 bill to keep safe for him because he can't trust himself to stay clean with money in his pocket. 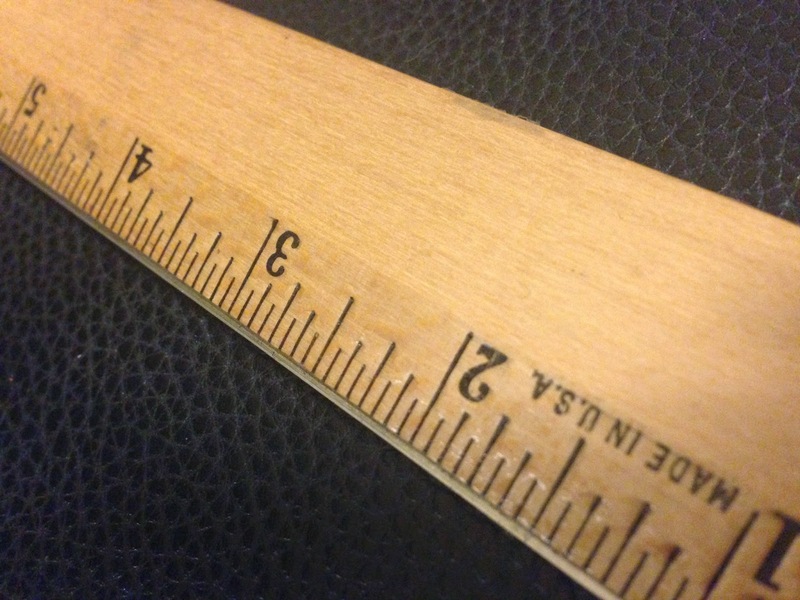 Those might be inches to some people, but I see it through their eyes--they have traveled miles. Sometimes I forget. I get busy, tired, frustrated, and worn down to my achy bones, and I forget that an ant can carry more weight in proportion to its body than any grizzly bear can. Small success, slow victory--they aren't second class. Any success--whether it be conquering The One Binder or recovering from an addiction--deserves to be seen for the milestone it is. When life gets busy, finding time to write is hard. Finding the energy, motivation, or inspiration to write when you do find the time can be even harder. The longer I sit and try to make things work, the harder it gets. I can't find my way to get back into whatever it was I was writing before life stalled me out. I can't find the voice, momentum, motivation, or character, or purpose. This weekend I spent some time--a few slivers at best--staring at pages I've written and looking for the door. I remembered writing some of it, and some of it was like reading someone else's work. Some brought back the struggle, and some I remembered writing as my pen skated happily along, full of fun and imagination. I could look in the rear-view mirror and see where I had been, but nothing on that page really told me where I need to go. The problem isn't plot or outline. I wish it was that simple. I know what needs to happen. My problem is that I can't seem to push myself hard enough to just throw it on the page. I think I've found my problem though: it's that darn rear-view mirror. Looking backward can tell you a lot of things about where you've been, but it doesn't do anything for you when it comes to looking where you're going. When I think about beginning work on my projects, I knew so much less about what I was doing and where I was going than I do now, and yet the writing came easier. That was probably because I wasn't trying to live up to my own ideas, I was just writing my way through it. There was nothing in the mirror, only the road ahead. I'm going to write today. I don't know what it will be or how it will turn out. The voice of my characters may not match what I wrote a month ago, but that's okay. In another month, I won't match the person I am today, and when I read back over it, those things will be easy to fix. The important part is to pry my eyes away from what was and focus on what will be. If you're like me and have a habit of getting caught in quicksand, I encourage to you pick up your pen with me today and start again. Don't look back, don't look too far ahead, just start right where you are. Here's hoping we can meet on the finish line. It can get to be a pretty crazy game and is great for laughs, but the entire time we played I kept wishing I had a notepad next to me to write down some of the silly juxtapositions that popped up from the deck. Every card in the pile is like a crazy writing prompt. Even though all the combinations are unbelievably random, some were almost uncannily combined, like they belonged together despite all the deck shuffling and card switching. I enjoyed spending time with friends and having some much needed laughs over a silly, cool game, but even more than that, I am grateful for the creative refresher. I have found myself with blinders on lately. I've been in a creative rut and I forgot how to have fun just "mixing colors" to keep things fun and alive. Even in some of my writing projects with a darker edge, there's no point in reading on if you're not sure I can twist the end for you or send you careening down a dark hallway you hadn't noticed at first pass. Basically, I've spent so long just trying to put one foot in front of the other, I forgot how to dance. 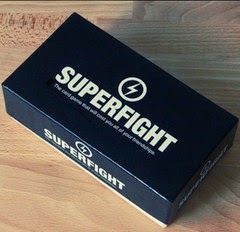 If you're like me and your work is getting stale, take a cue from Superfight and draw a card from the middle of the deck. That's the only way you will come up with the game-winning neurotoxin-spraying housecat who wins a singing contest, and besides--you might accidentally have a little fun. Accidental fun is the very best kind. I wouldn't say today was a bad day. A bad day is like the one a few weeks ago when I was almost killed in a near-miss car accident, I got the worst papercut I've had in years, the door handle of my car broke off, and (if that was not enough for a king-sized bad mood), a resident of my housing program passed away in his apartment. This is just "one of those days." Today was just the kind of day when nothing--nothing, mind you--went to plan. Everyone needed something, and I found myself all out of somethings...and out of air conditioning in my car. Did I mention it is hot in Memphis in the summer? It was the kind of day where I drove my boiling, paint-peeled car around in circles so much I didn't notice I was almost out of gas, the kind where I worked most of a whole day before I ever got close enough to my desk to see my daily planner, the kind where I told someone with a straight face I couldn't possibly go to a party because I smelled like Secretariat. I said it's hot in Memphis. Everyone without air conditioning smells like Secretariat. I'm lucky to have friends and colleagues to whom I can vent, who laugh at my pathetic attempts to drop a honey-glaze on everything with a few bad jokes, and who tend to think no less of me on my bad days than on my better ones (or at least they treat me just the same). I am grateful for Husband, to whom I can merely whimper and he will have pajamas and a good book ready for me at home. Maybe it is these days, the in-between, run-ragged days that give lighter ones their shine and darker ones their heft. It's like exercise. Without days like today, I wouldn't have the muscles I need to get through a really bad day. I found this note wadded up in the back of my nightstand drawer while I was pawing through for change. I don't know why I shoved it in that drawer, but I'm glad I found it. 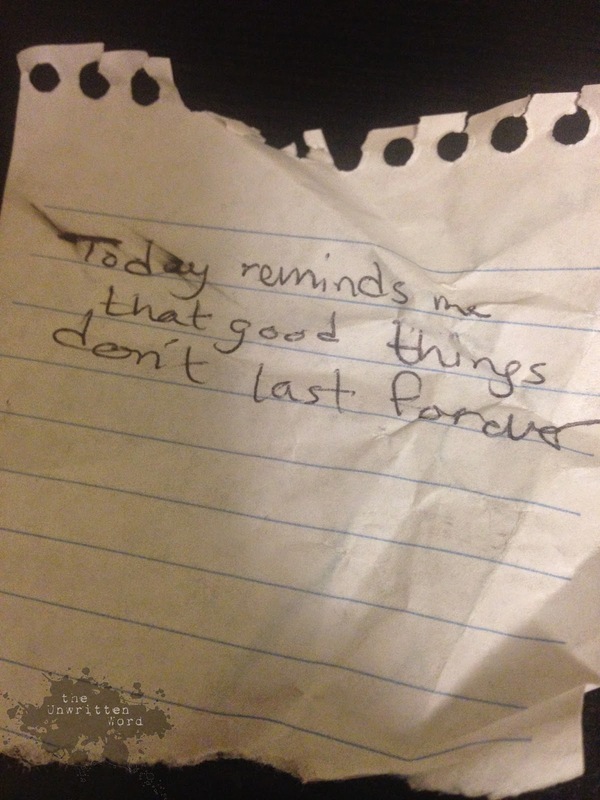 Today reminds me that bad things don't last forever either, because I have no idea why I originally wrote that note. Days like today make me wonder what I'm made of. When the going gets tough and I get tougher, I think I'm a rock. I'm strong. I'm granite. But then there are those scissors. They're sharp and when they come biting, I just don't have what it takes to crush them. I'm no rock. I'm no scissors either. I guess that means I'm paper. I'm paper because everyone I meet who has survived the streets is a rock. The best I can ever hope to do is to cover them, not in defeat, but to share peace with them. Peace at last. 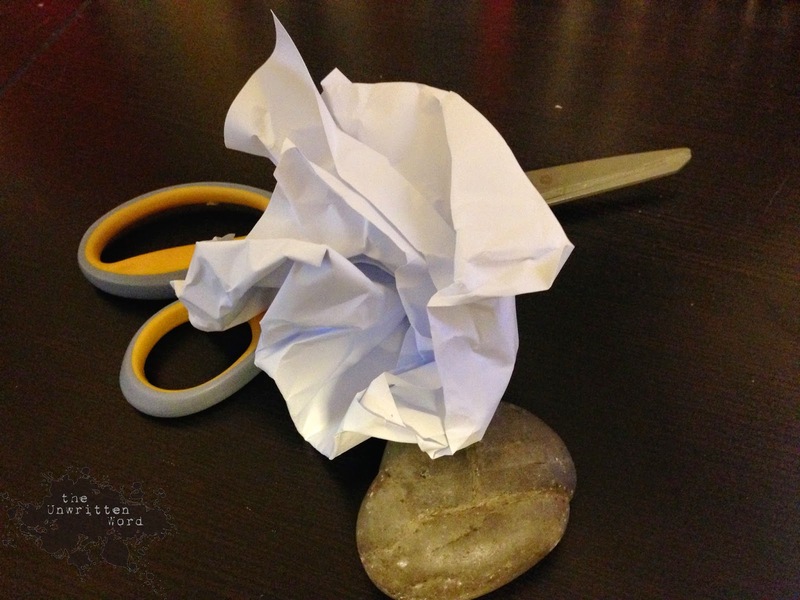 I'm paper because those scissors, when they come snipping, they get right into the meat of me and slice me up. I'm going to tell you I'm fine, but I'm not. I'm just paper, after all. I'm paper because you can fold me seven times, but no one will get that eighth crease. I'm paper because even ripped, torn, wet, and erased, what was written upon me became real when the ink dried, even though no one need ever read the words. I'm paper, and that's all I would ever aspire to be. Ever notice how no one ever stops there? There's always something else, something into which the hope must be funneled, a cake which must be iced. "I'm hopeful I'll hear back about that job." "I'm hopeful my electric bill doesn't go up again." "I'm hopeful the pizza turns out better this time." "I'm hopeful I will find some time." "I'm hopeful the tests will be negative." "I'm hopeful this won't last." Hope within boundaries only allows us to hope for what we've already conceived. That's not hope. It's a wish. Hoping to reach a goal isn't hope either. It's a plan. Hope is a wild thing that grows and spreads without heed or permission. It will sit on your shoulder and teach you patience, optimism, and kindness. It will sing you peace. Hope will keep you alive and heal your wounds, but only if you don't look it in the eyes and tell it what to do. to listen to it whisper in your ear. I'm not hopeful for anything. 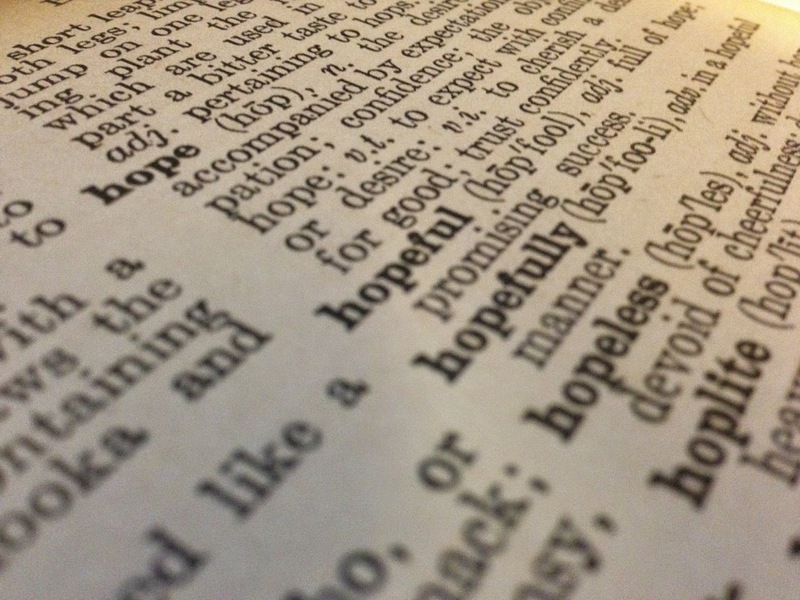 That means I'm hopeful for everything. He was slow. There was no denying that. In the span of time my little battalion waited in line, his colleagues zoomed through the rest of the patrons in short order. I don't know what held him up, but I didn't mind waiting. That's what lines are for. "What on earth is taking so long?" grumbled a tiny woman in front of me. She was short enough that I could see right over her head, but she had a tone that said not to make a habit of it. "It's the post office on Easter week," I said. "Probably a lot of packages to sort through." She looked up at me over her glasses, "Hmmm," she said, and kept on looking at me. "And it rained yesterday," I added, thinking of the new hardcover book I had come after, and being grateful it hadn't been waiting in a puddle when I got home the day before. I hoped maybe she'd think of her own dry, safe package and wait a little happier, maybe crack a grin or at least blink a few times. Another person joined the pick-up line and tapped her hard-soled toe on the scuffed tile. I guess that's how it got scuffed in the first place, waiters not wanting to wait. "What on earth is taking so long?" she asked before I'd even had time to lean my sore back against the wall. Before I could answer, the short lady leaned around me and said, "That man up there! He's so slow." "Exactly," said the tiny woman. She finally smiled. The man came back to the counter and scanned the package he had finally located for the couple with the sleepy baby. He took a long time. They grumbled and shifted their weight. They took turns huffing and toe tapping and counting people who came in the door after them and left before them. I waited. I didn't mind. The man behind the counter went back for another package. A guy came through the door and stood behind the toe-tapper. "What on earth is taking so long?" he asked, as soon as the door swung closed behind him. The trio talked about lines and waiting and tapped and blinked and huffed. I watched through the blinds at what slivers of sky I could see, and I waited. Eventually, another employee came and took our cards, four at at time, and rushed to the back to forage for our boxes. She was back in no time, and the short lady and the toe-tapper rushed forward to claim their packages. The man behind the counter came back with his package, too. I took a good look at him, the rounded slump of his shoulders, the trenches under his eyes, the row of unruly hair that had defied his comb and ran up the back of his head like hackles. He was slow, there was no denying that, but there was no less work in him than any of the rest of us, workers and waiters alike. 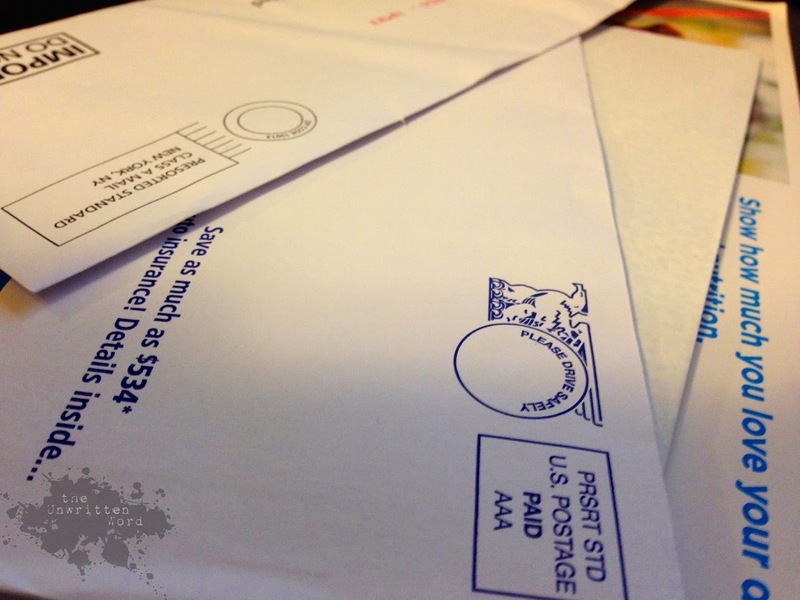 He wore a look that said he was sorry he was slow, but it was Easter week at the post office after all. And it had rained. I wish I would have stayed there and waited in his line, just so he would know. 1. 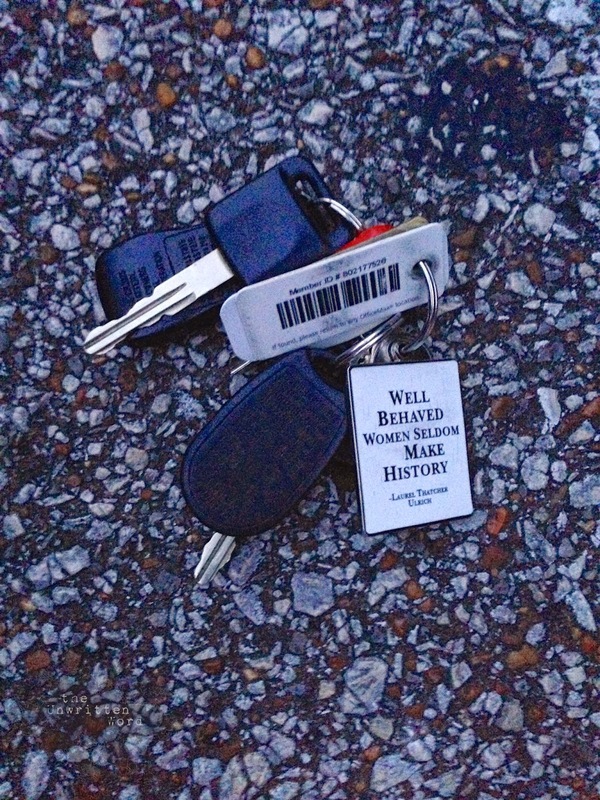 Dropping my car keys in a busy parking lot. I can't bend over to get them. Well, I could, but there is a distinct possibility of becoming a knurled-up back-hating speed bump in the process (and I probably still wouldn't be able to reach my keys). 2. Petting the animals. No matter how much they beg for attention when I come in the door, I must harden my heart and avert my eyes. Cats are short. 3. Stairs. The world is FULL of stairs. 4. Driving. It seems simple enough. I always think so when I get into the car. Then I remember that car seats are not comfortable, and that changing lanes and reversing require turning around in the seat. My back doesn't like turning. It doesn't like it at ALL. I have to three-point turn things I should be able to do with a Mack truck in one go because I can't see behind me well enough without being able to turn all the way around. 5. Walking. Ouch. Just...ouch. Sciatica=I would gnaw off my own appendages if I was able to bend over far enough to do it. 6. Sitting. I like sitting. I can do that. 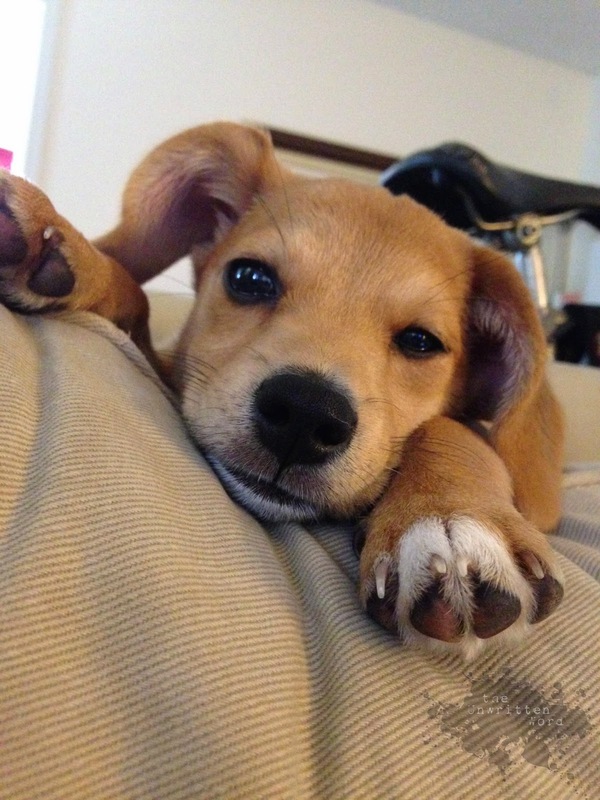 I get all uncomfortable and squirmy after a while, but generally, sitting is about as good as it gets. Until I stand up after doing it too much. Then I have the kind of binge-regret usually saved for a tub of Ben & Jerry's. Sitting is a sometimes food. 7. Showering. The parts of me that I can't reach need to be clean too, and if I manage to slip in the tub, there I will stay until the shower spray water torture drives me mad and I go frolicking in the pain-free fields of my mind for all eternity. 8. 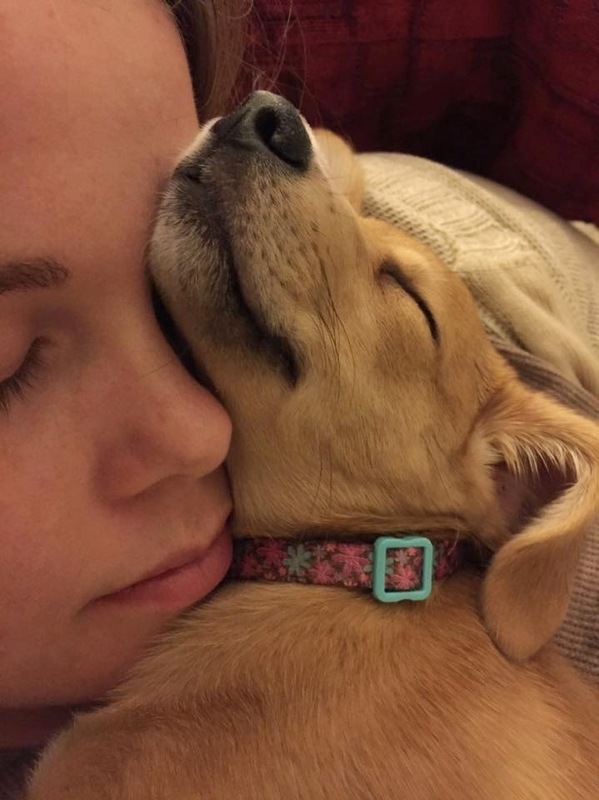 Sleeping. On my back=pain. On my side=pain. On my other side=pain. On my stomach=pain. I'm out of sides, and I can't sleep standing up...I don't think. 9. Casual motion of any kind. Carrying anything, picking up anything, putting down anything, reaching for anything: all scary. I don't make a move without being acutely aware of the fact it will probably hurt. Even if it doesn't, I wince anyway. In this case, preparation always beats surprise. 10. Writing blog posts. Okay, this one has absolutely nothing to do with my back and everything to do with my calendar and my brain. I am wrangling those two ingredients currently so I can get back into the groove of things with my writing. Short of the water torture mentioned above, it is one of the only activities in which I can frolic in pain-free fields and live to tell about it. "Keep on Truckin'." We throw that around a lot, and we know what we mean. When the going gets tough, keep on going. You can't get much simpler than that. I've said this phrase a lot lately (and had it said to me), so it got me thinking about how such a phrase became part of our everyday vernacular. 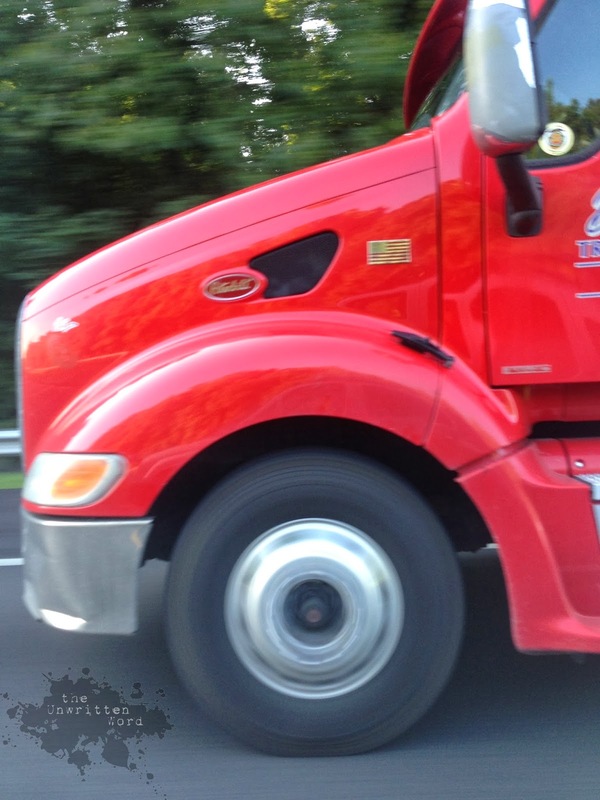 When I'm out driving on the interstate, I do think about the big trucks and the people who drive them. Much of the time, I'm trying to avoid being stuck beside them because, courtesy of my overactive imagination, I can just see my car getting swept up by one of those huge tires, leaving me and my car on the side of the road like a crumpled tissue. If cars were dinosaurs, a big rig would be a T-Rex and my Nissan would be something little and cute, like a prehistoric turtle. I'm not betting with those odds. I also think about the people driving those trucks and what it would be like to have their job. It's a hard one, no doubt. Lonely, monotonous, exhausting, and a little dangerous. I imagine that sometimes life would feel a little surreal, since people in the transport industry definitely have to play fast and loose with time and space. You can't make a hot meal, you're stuck eating what you can find on your route. You can't curl up in your bed with your spouse, you have to crash in the sleeper or, if there's time, grab a quick night's sleep in a strange motel bed. I can see some romance in it though. I would miss Husband way too much to ever hit the road like that without him, but the idea of driving on and on, all alone with my thoughts, is kind of appealing. There is so much to see in the world, and I keep saying I'll get out there to see it one of these days, but I never have the time. If this was my job, that is all I would have: time to drive and look and think. Interstate just looks like interstate, but there is life happening just off the sides, always. I guess it is the illusion of freedom that appeals to me, but I am smart enough to know that it is just that: an illusion. That is why we say, "Keep on truckin'," after all. No matter what happens, they have to get where they're going, intact, and do it on time. I could see a story in that. Maybe you can, too. Imagine you're the one in the driver's seat. You're high off the ground, the biggest thing on the road. You're controlled; you have to be. 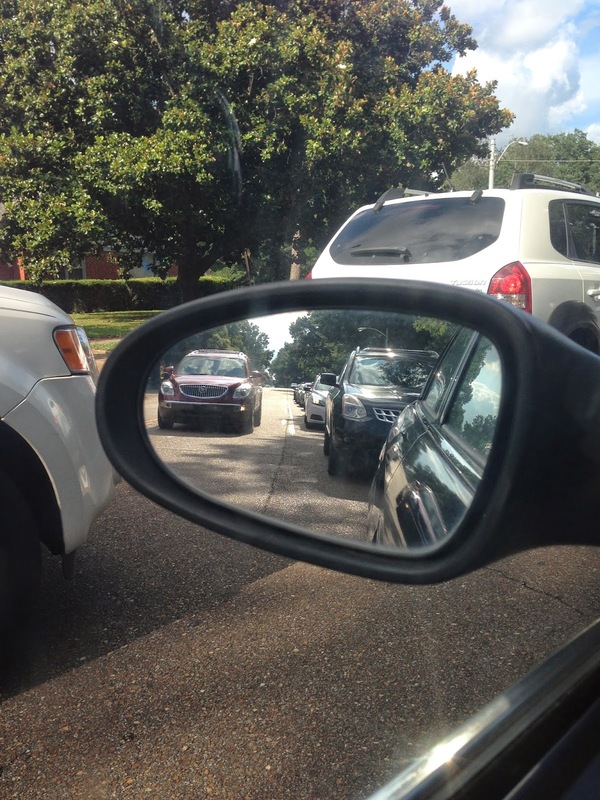 Those tiny cars just keep zooming around you like a swarm of gnats, and it is your job not to squish them. You're tired, your eyes are dry. There's a cramp in your neck. The cab of the truck smells like onions. 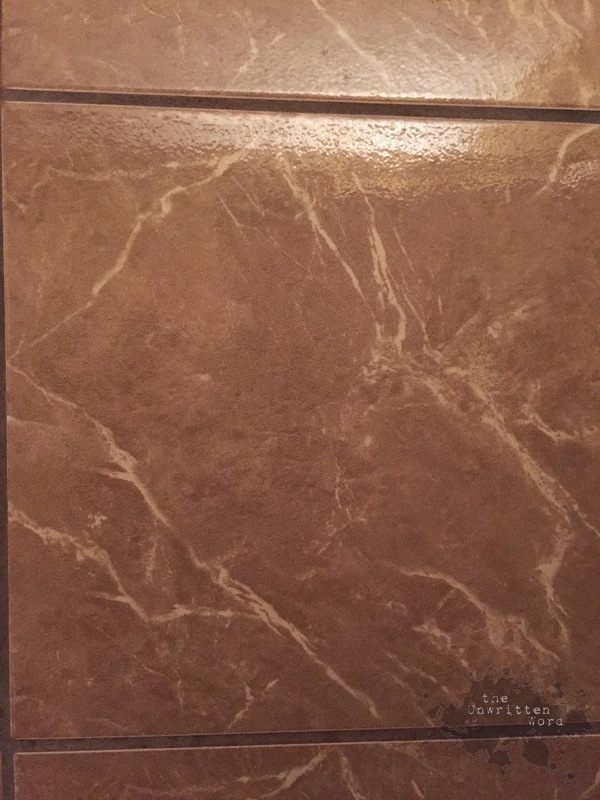 You want a hot shower in your very own bathroom more than just about anything, but there's no use worrying about that. You've got a job to do. Your trailer is special. This isn't just another load of Florida oranges coming up for a high school fundraising sale. This load, you're told, means something. You don't know what it is, and the boss isn't telling you. The rig is locked tight with a special combination lock, and you don't have the code. Whatever this is, it has to reach its destination, and it has to be there on time. They're waiting. This is not a smooth run. You've lost a re-tread and your gas gauge doesn't seem to be working right. You hit a familiar truck stop to refuel, only to find it closed and boarded up. Then there's something about the way that State Trooper is tailing you that you just don't like. What's in the truck? Why is it so important? Where are you going? Where have you been? What's with all the bad luck, and is there a reason for it? Why does the cab smell like onions? Fill in the blanks and see where it takes you. Just make sure you reach your destination on time. Sometimes, you just want an ink that makes a statement. When you hear a name like "Dragon's Napalm" you should already be prepared for an intense, unique color. This ink definitely delivers in that aspect. 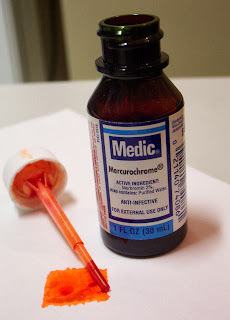 The man behind Noodler's Inks, Nathan Tardiff, has stated that he wanted to capture the unique color of Mercurochrome, a popular antiseptic in the 70's and 80's, known for the fluorescent red/orange stain it applied to everything it touched. 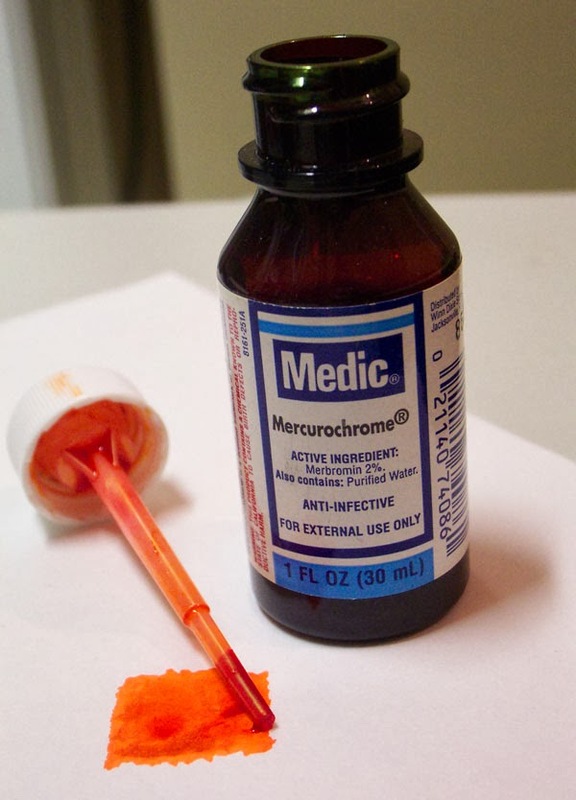 I'm a little too young to remember ever having used Mercurochrome, as it was already falling out of fashion in my youth due to concerns about its mercury content, but there is no denying that it is a unique, vibrant color that probably invokes memories for a lot of people. Personally, I went after this ink because I wanted something fun to write with when I felt I needed a little pick-me-up. Sometimes a little novelty goes a long way with me. Anyway, this ink doesn't get to come out of its cave too often, but when it does, I really enjoy it. I haven't noticed it staining any of my pens yet, but I don't know if that is because it isn't as stain-prone as I would think given the high dye content and color, or if I have just confined it to pens that are pretty resistant to staining anyway. 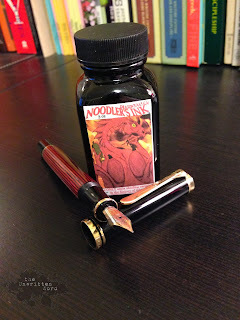 Noodler's inks are a polarizing topic in the fountain pen community since some of the zany ideas that work their way out of those Noodler's bottles can be a little finicky if you aren't sure what you're getting into. 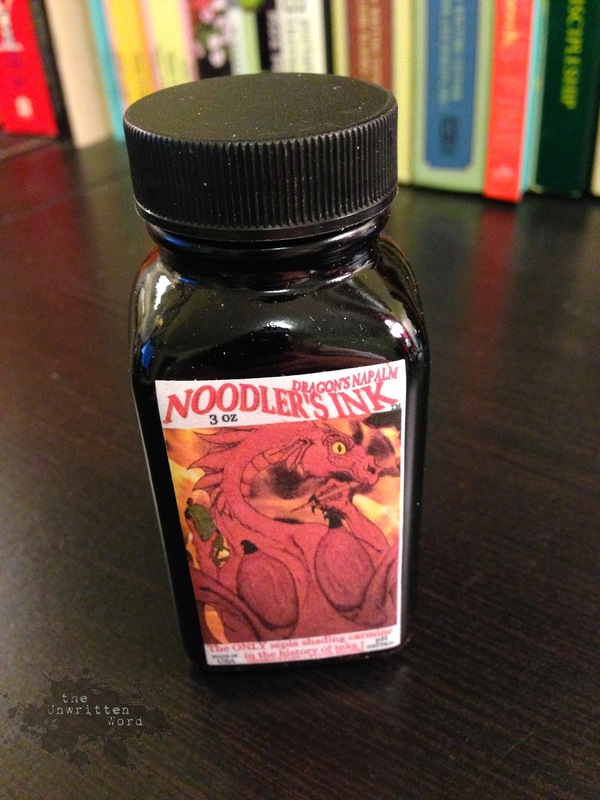 Personally, I'm a Noodler's fan and use their inks widely. That said, this is one I handle with care, much like Noodler's Baystate Blue (which is about as controversial as the Affordable Healthcare Act). 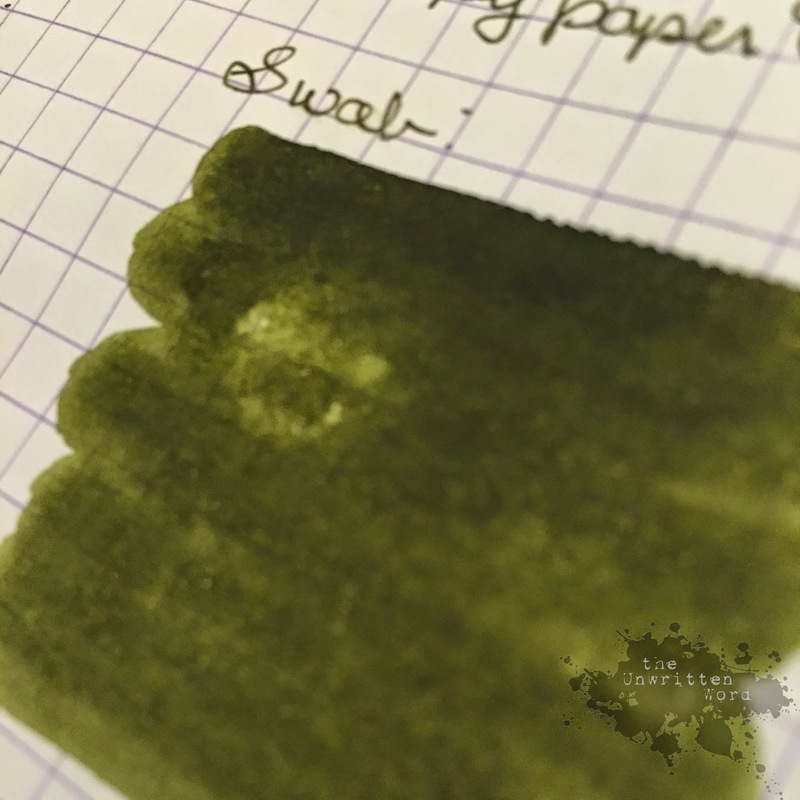 I haven't actually had any reason to believe this ink would harm a pen--repeat, it has never harmed any of the pens I've used, including my husband's beloved Pelikan m800--but I do tend to confine it to pens I know I can take apart and clean easily and ones I do not believe will conspicuously stain. I do not have to be burned by a dragon to know that fire is hot. 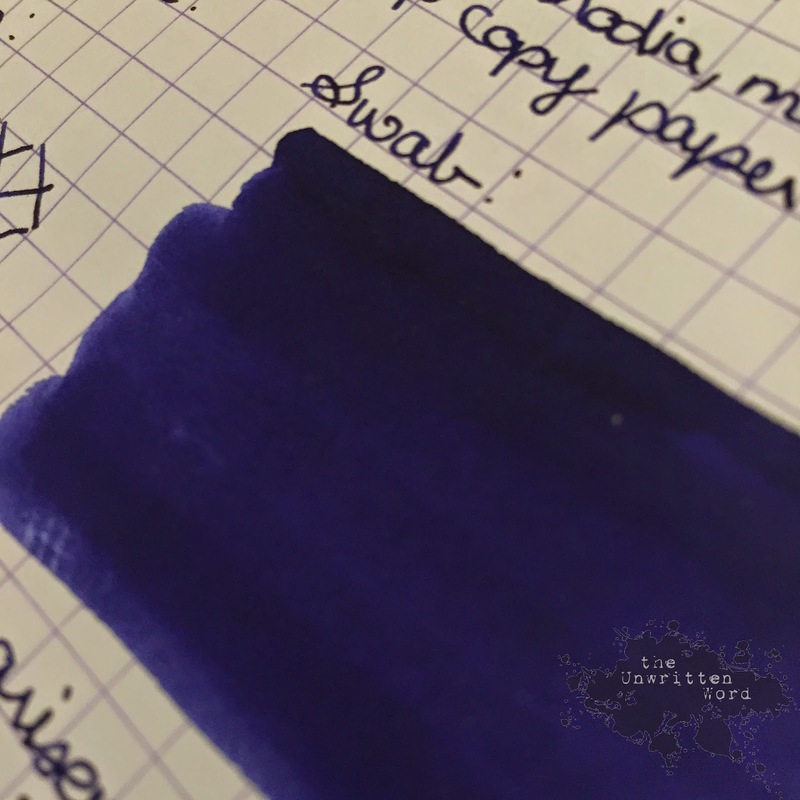 I have to admit, I long to see this ink sitting in a clear demonstrator, like my TWSBI Diamond 540. That color can really wake you up, and I think it would be fun to see it sloshing around in a crystal clear pen. 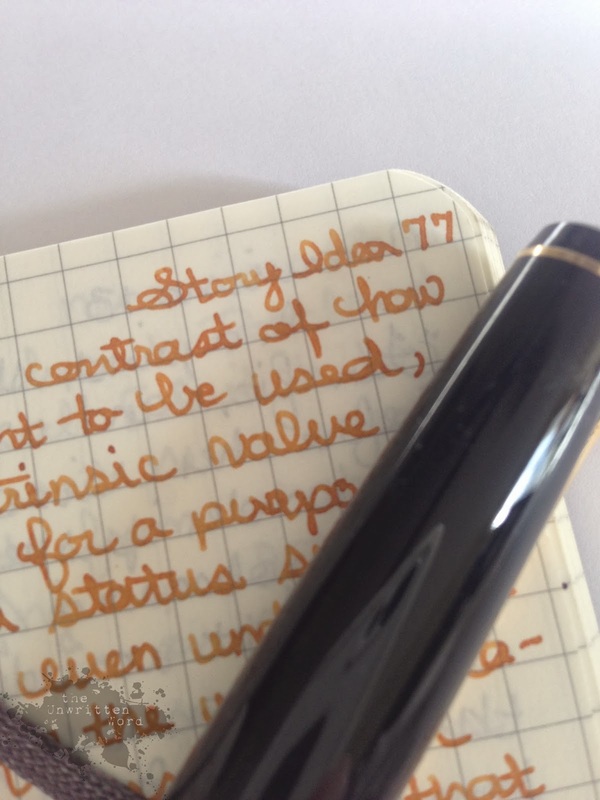 As for performance, this ink is on the dry side. I tend to like the smoother feel you get from more lubricated inks, but dry inks are not inherently bad. 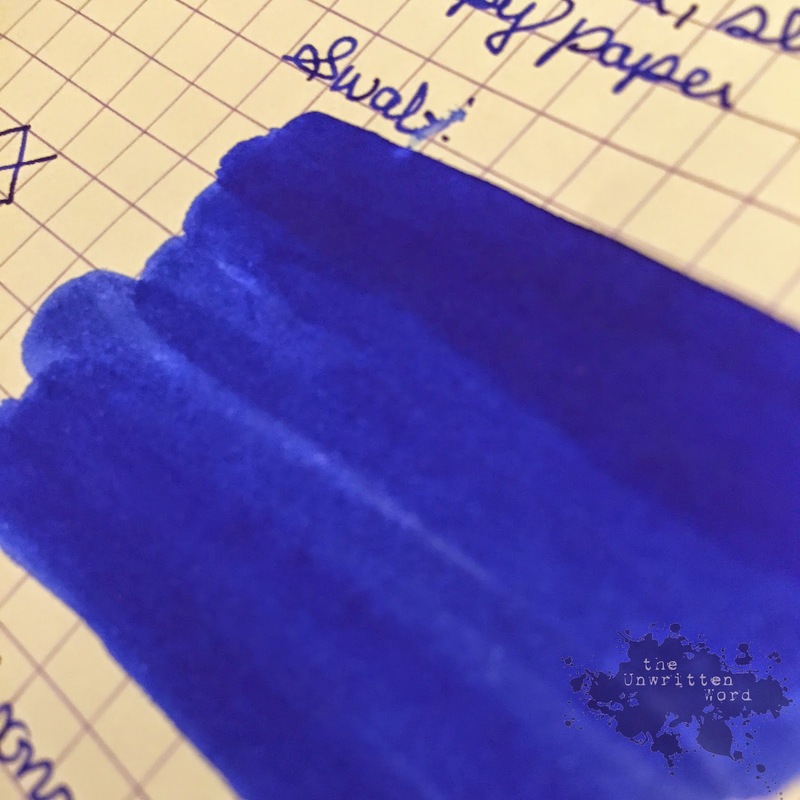 If you use finer nibs, you might notice a little more scratch when you write than with some other inks, but it is not a deal-breaker. Dry inks do tend to make me a little paranoid that my pen is going to clog, so that is sometimes a distraction for me. 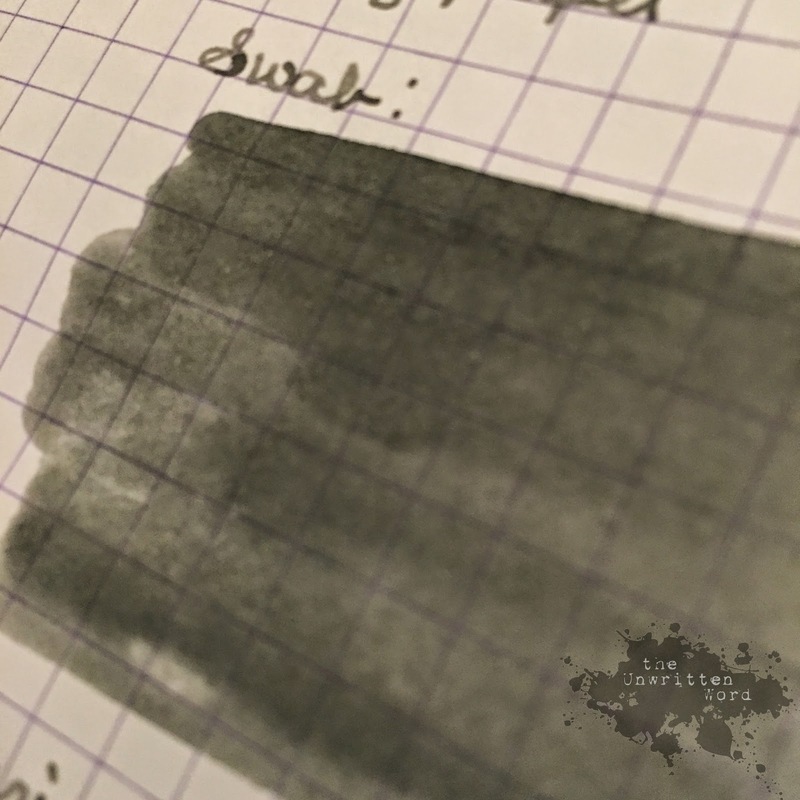 This ink is certainly dark and clear enough to use for regular writing, though you might want to put on sunglasses if you're reading back a full page. It is also great contrast ink, and I can see myself reaching for it to underline or edit. You would certainly not miss any margin notes written in this stuff. This ink is so hard to photograph. I did the best I could with the review, so hopefully it is close enough to give you an idea. Probably not, though. This stuff really burns out your eyeballs in person.